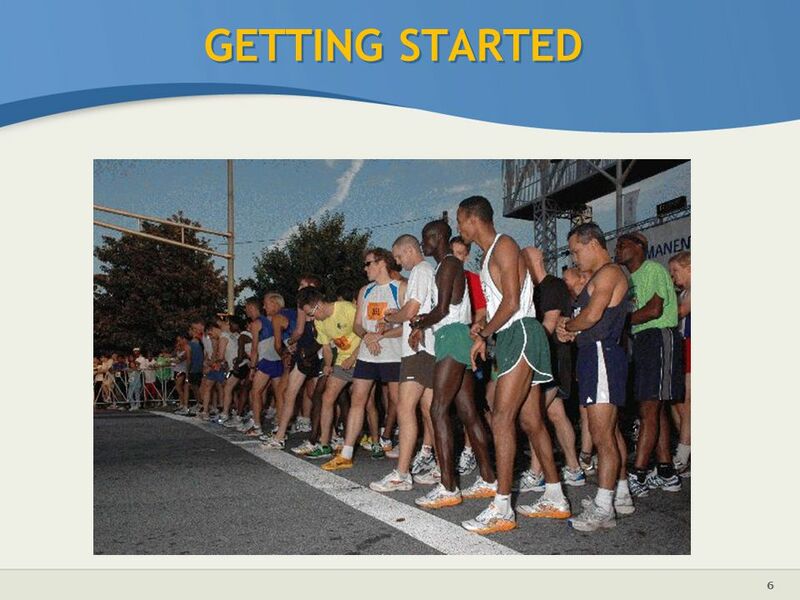 2 Purpose This course is an introductory level course for beginners. 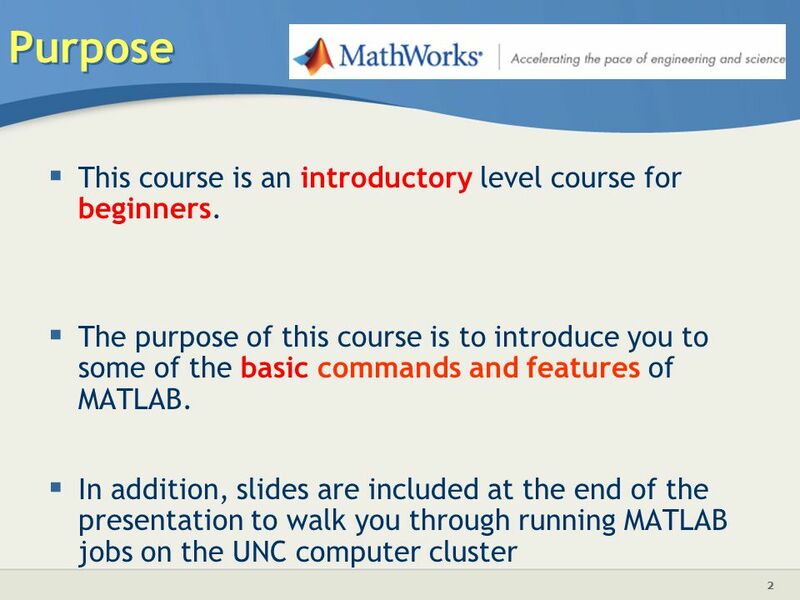 The purpose of this course is to introduce you to some of the basic commands and features of MATLAB. 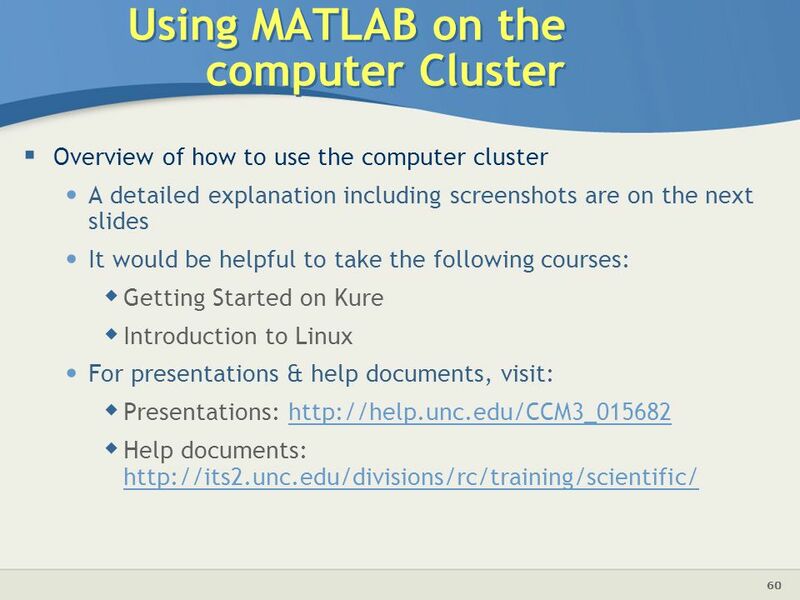 In addition, slides are included at the end of the presentation to walk you through running MATLAB jobs on the UNC computer cluster Basic content slide: Add slide title and slide text in the appropriate places. To create a new slide, go to “Insert > New Slide” from the main menu. 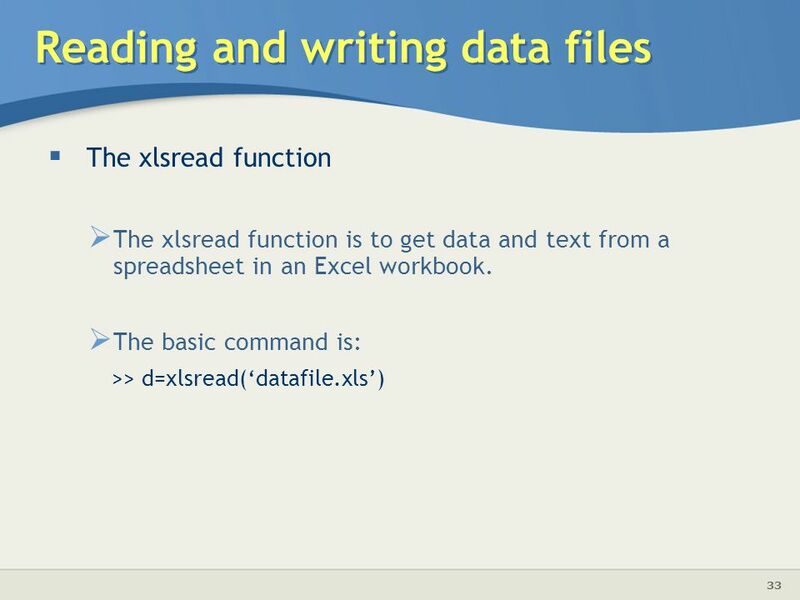 Matrix generation Reading and writing data files Basic plotting Basic programming Basic content slide: Add slide title and slide text in the appropriate places. To create a new slide, go to “Insert > New Slide” from the main menu. 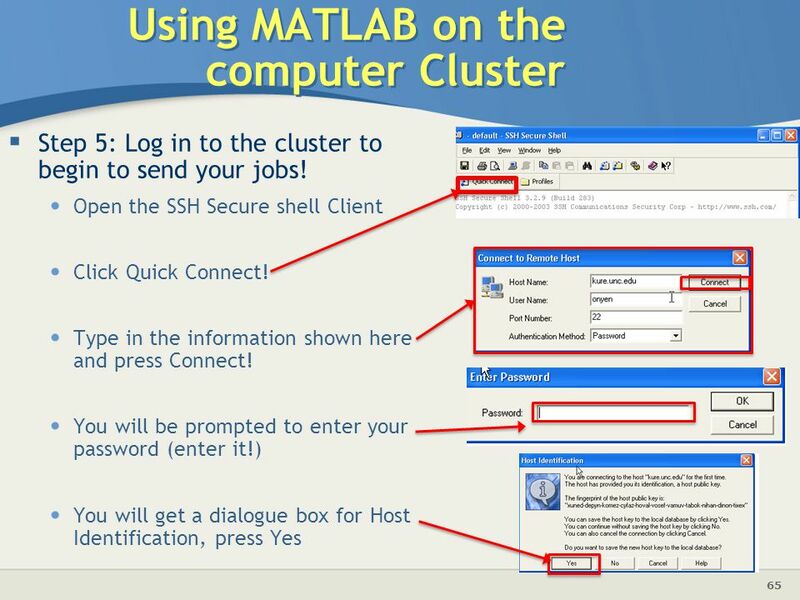 It is good at dealing with matrices Vendor’s website: http//: Advantages of MATLAB Ease of use Powerful built-in routines and toolboxes (LOTS!!!) 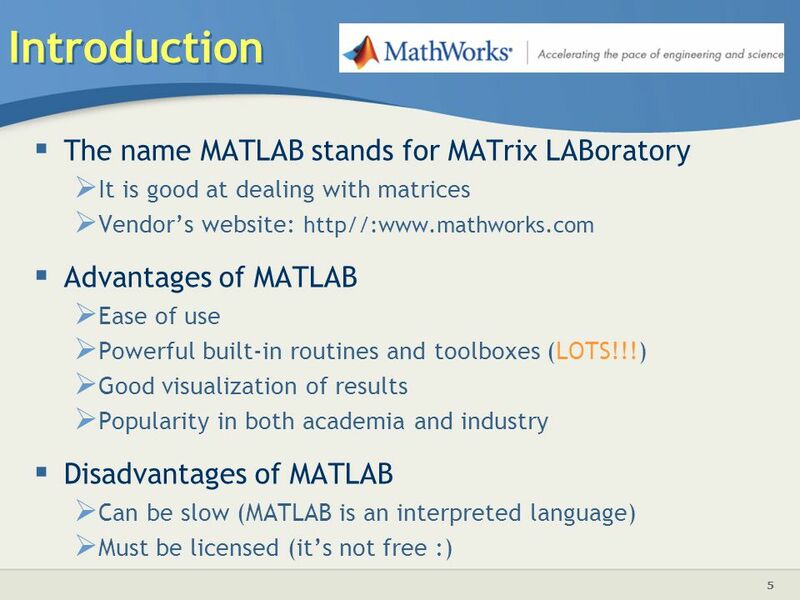 Good visualization of results Popularity in both academia and industry Disadvantages of MATLAB Can be slow (MATLAB is an interpreted language) Must be licensed (it’s not free :) Basic content slide: Add slide title and slide text in the appropriate places. To create a new slide, go to “Insert > New Slide” from the main menu. 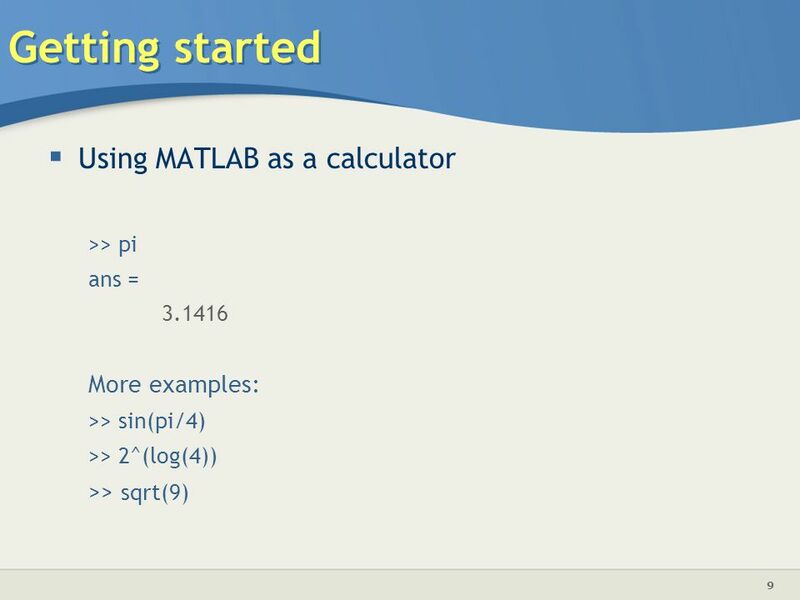 >> pi ans = 3.1416 More examples: >> sin(pi/4) >> 2^(log(4)) >> sqrt(9) Basic content slide: Add slide title and slide text in the appropriate places. To create a new slide, go to “Insert > New Slide” from the main menu. 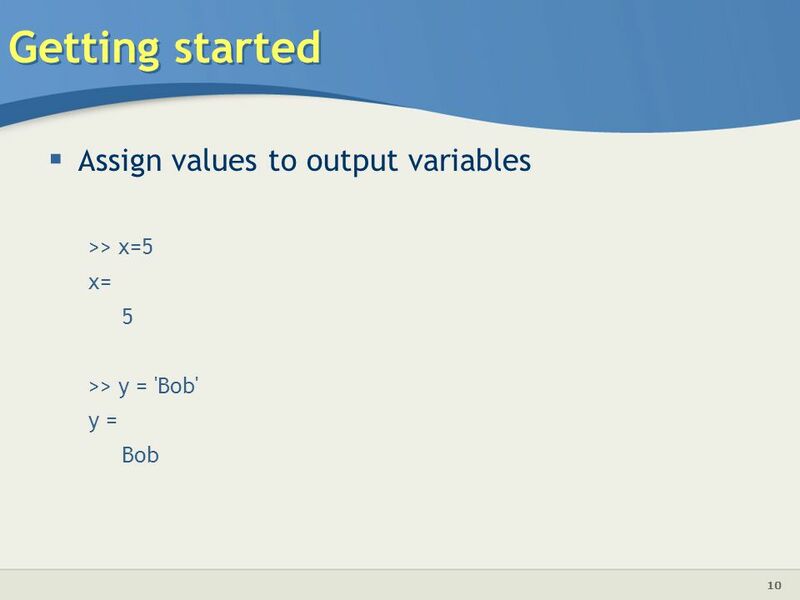 >> y = 'Bob' y = Bob Basic content slide: Add slide title and slide text in the appropriate places. To create a new slide, go to “Insert > New Slide” from the main menu. 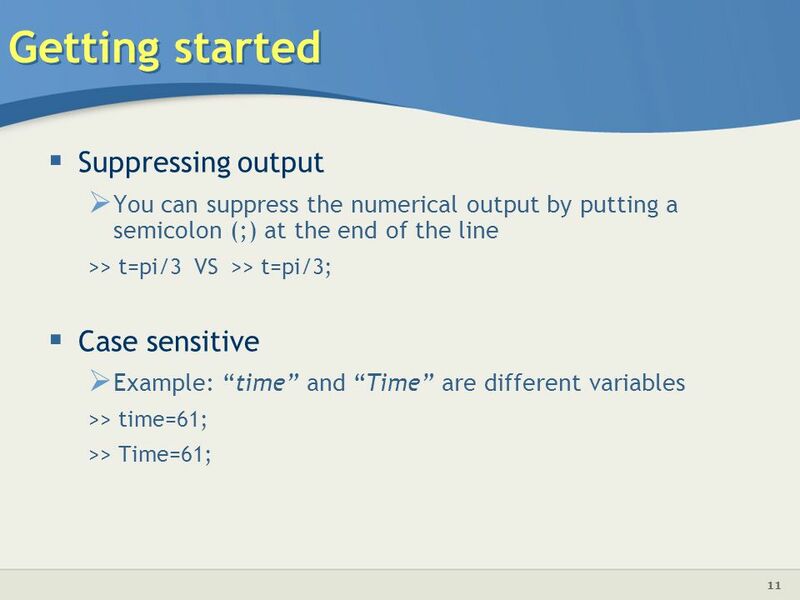 You can suppress the numerical output by putting a semicolon (;) at the end of the line >> t=pi/3 VS >> t=pi/3; Case sensitive Example: “time” and “Time” are different variables >> time=61; >> Time=61; Basic content slide: Add slide title and slide text in the appropriate places. To create a new slide, go to “Insert > New Slide” from the main menu. 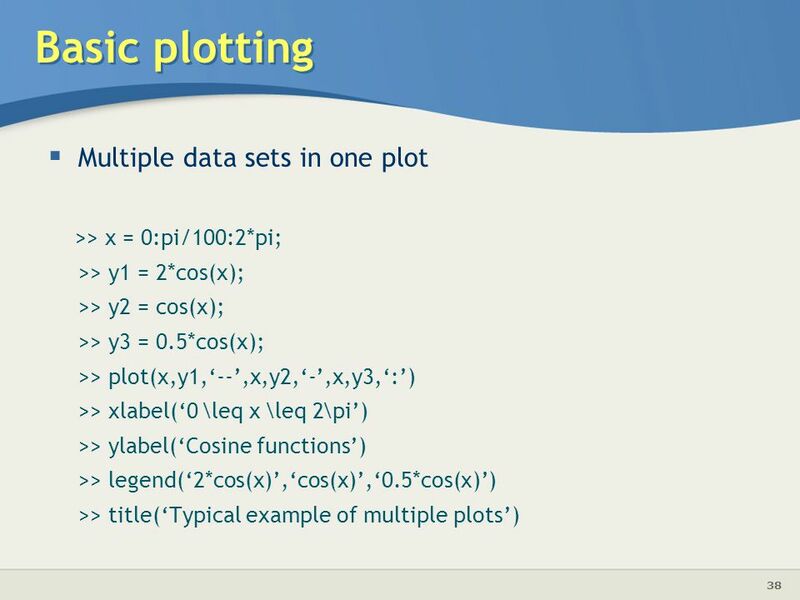 The results of one problem may have an effect on the next one Use whos to list current variables and give information on size, shape, type etc. 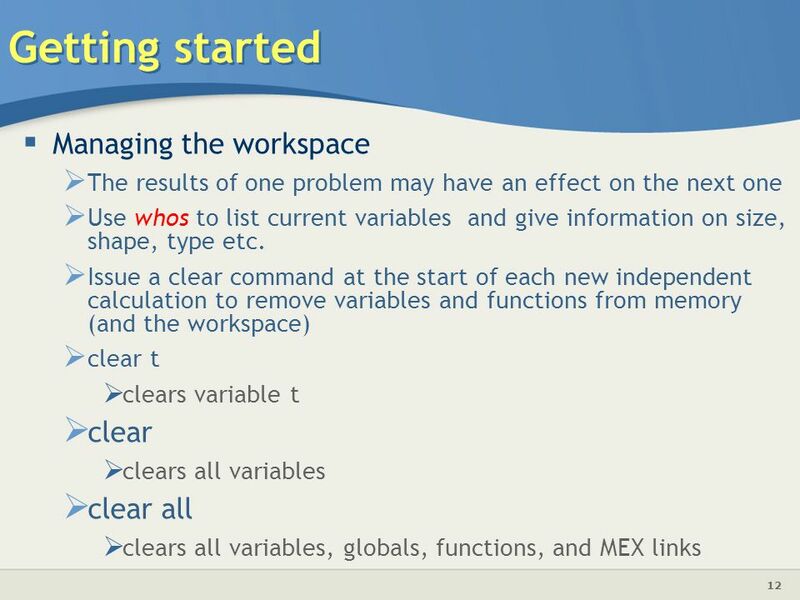 Issue a clear command at the start of each new independent calculation to remove variables and functions from memory (and the workspace) clear t clears variable t clear clears all variables clear all clears all variables, globals, functions, and MEX links Basic content slide: Add slide title and slide text in the appropriate places. To create a new slide, go to “Insert > New Slide” from the main menu. 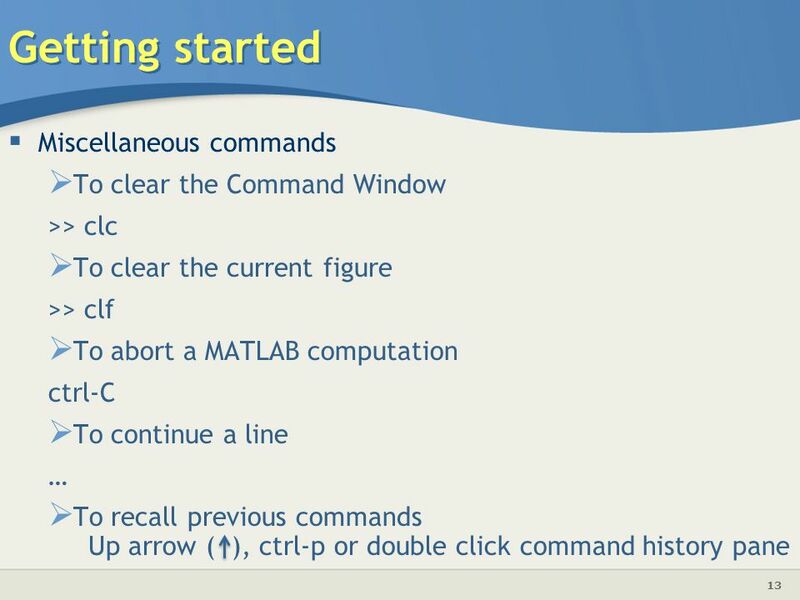 >> clc To clear the current figure >> clf To abort a MATLAB computation ctrl-C To continue a line … To recall previous commands	Up arrow ( ), ctrl-p or double click command history pane Basic content slide: Add slide title and slide text in the appropriate places. To create a new slide, go to “Insert > New Slide” from the main menu. 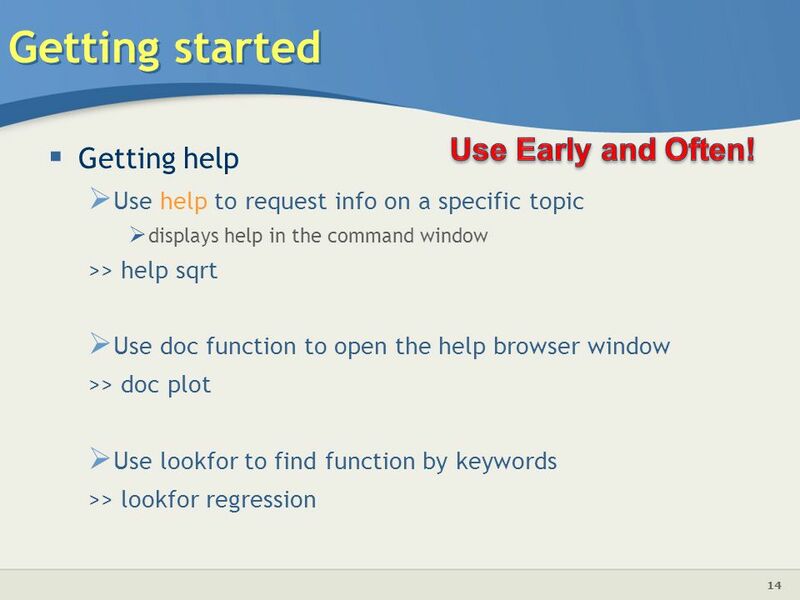 Use help to request info on a specific topic displays help in the command window >> help sqrt Use doc function to open the help browser window >> doc plot Use lookfor to find function by keywords >> lookfor regression Basic content slide: Add slide title and slide text in the appropriate places. To create a new slide, go to “Insert > New Slide” from the main menu. 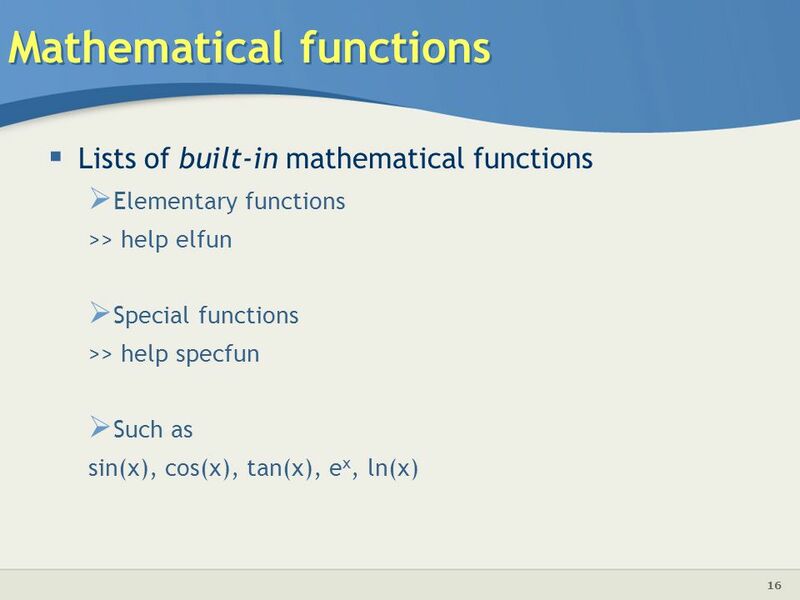 Lists of built-in mathematical functions Elementary functions >> help elfun Special functions >> help specfun Such as sin(x), cos(x), tan(x), ex, ln(x) Basic content slide: Add slide title and slide text in the appropriate places. To create a new slide, go to “Insert > New Slide” from the main menu. Example 1 Calculate z=e-asin(x) for a=5, x=2, y=8 >> a=5; x=2; y=8; >> z=exp(-a)*sin(x)+10*sqrt(y) z= Example 2 log(142), log10(142) Basic content slide: Add slide title and slide text in the appropriate places. To create a new slide, go to “Insert > New Slide” from the main menu. 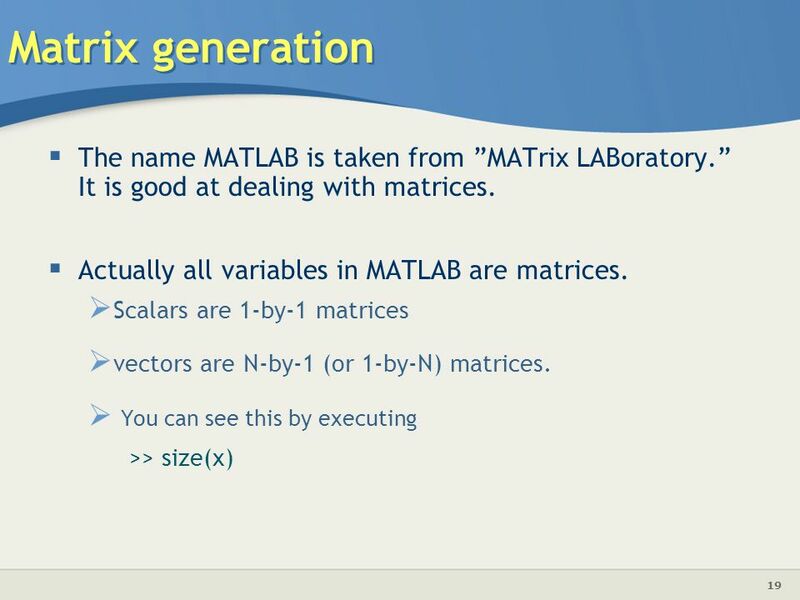 19 Matrix generation The name MATLAB is taken from ”MATrix LABoratory.” It is good at dealing with matrices. 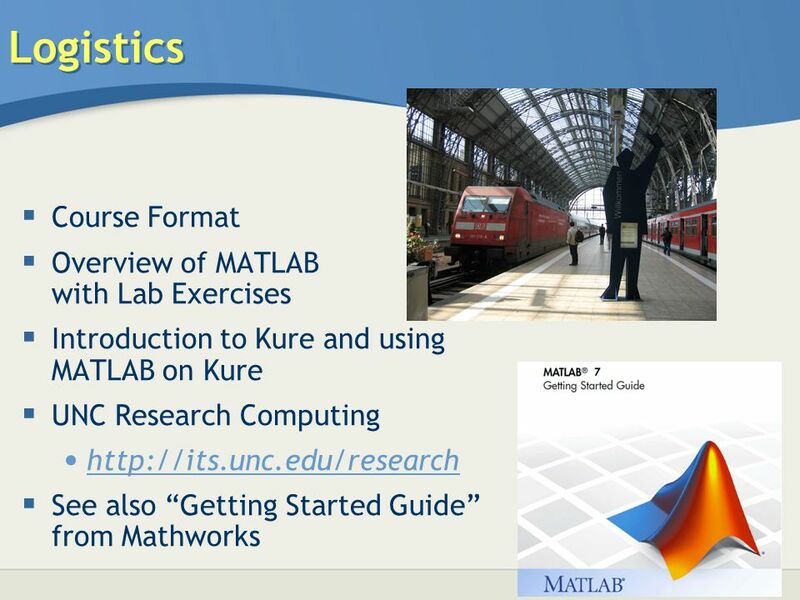 Actually all variables in MATLAB are matrices. Scalars are 1-by-1 matrices vectors are N-by-1 (or 1-by-N) matrices. You can see this by executing >> size(x) Basic content slide: Add slide title and slide text in the appropriate places. To create a new slide, go to “Insert > New Slide” from the main menu. 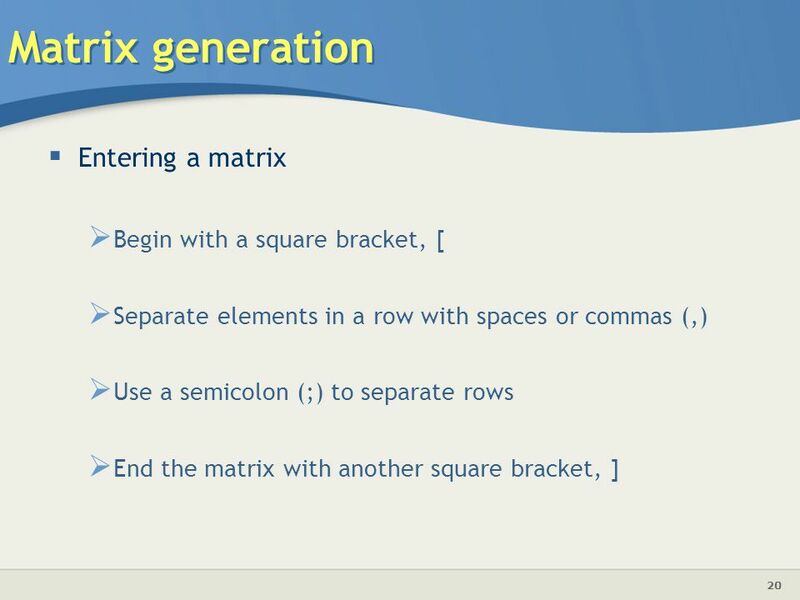 Separate elements in a row with spaces or commas (,) Use a semicolon (;) to separate rows End the matrix with another square bracket, ] Basic content slide: Add slide title and slide text in the appropriate places. To create a new slide, go to “Insert > New Slide” from the main menu. 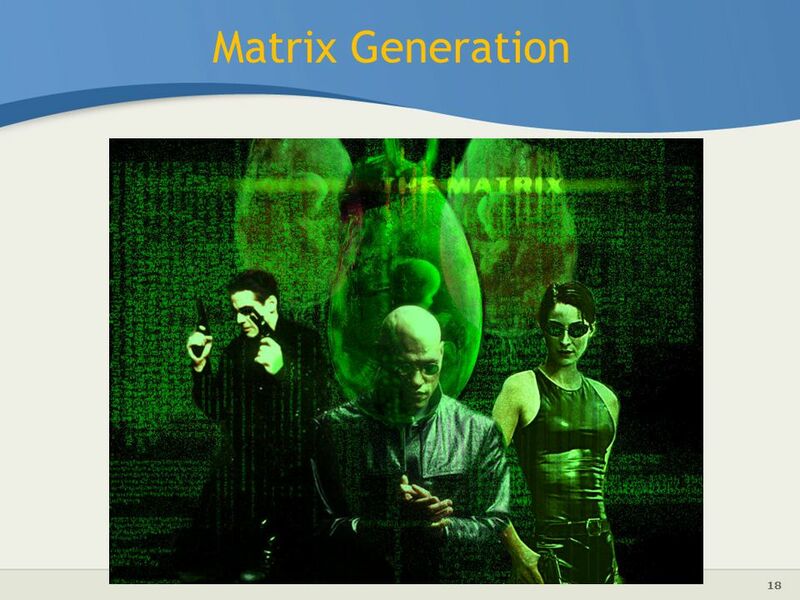 Basic content slide: Add slide title and slide text in the appropriate places. To create a new slide, go to “Insert > New Slide” from the main menu. 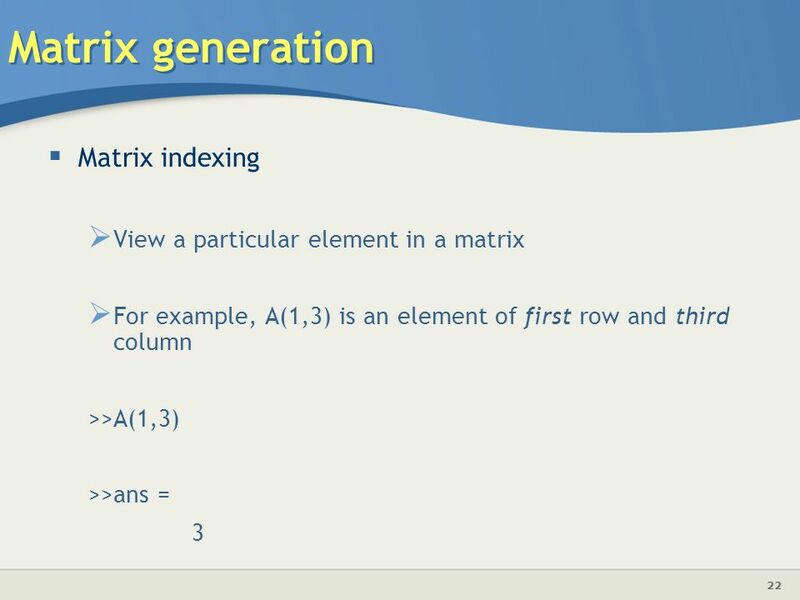 View a particular element in a matrix For example, A(1,3) is an element of first row and third column >>A(1,3) >>ans = 3 Basic content slide: Add slide title and slide text in the appropriate places. To create a new slide, go to “Insert > New Slide” from the main menu. 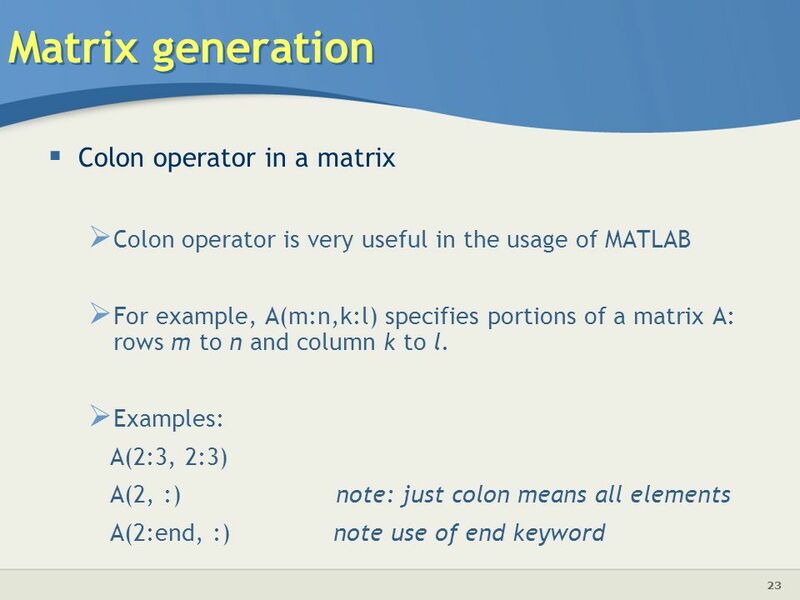 Colon operator is very useful in the usage of MATLAB For example, A(m:n,k:l) specifies portions of a matrix A: rows m to n and column k to l. Examples: A(2:3, 2:3) A(2, :) note: just colon means all elements A(2:end, :) note use of end keyword Basic content slide: Add slide title and slide text in the appropriate places. To create a new slide, go to “Insert > New Slide” from the main menu. 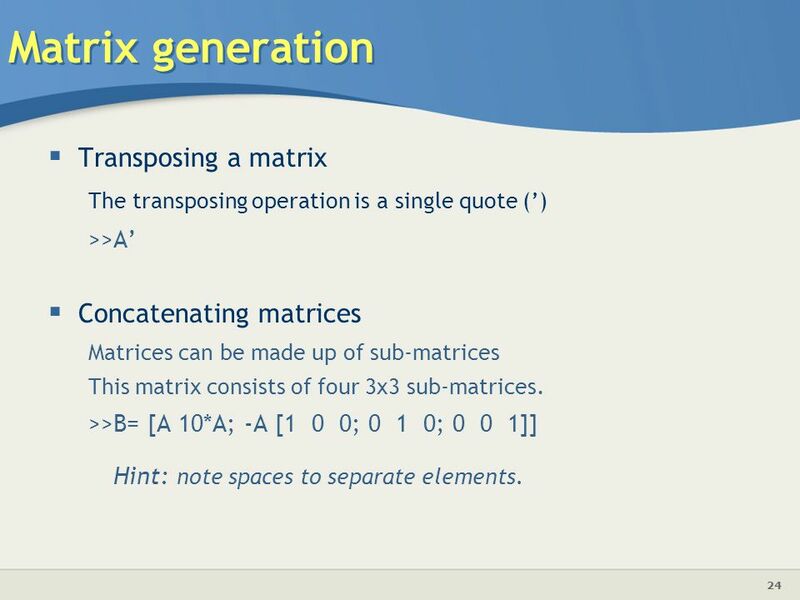 The transposing operation is a single quote (’) >>A’ Concatenating matrices Matrices can be made up of sub-matrices This matrix consists of four 3x3 sub-matrices. >>B= [A 10*A; -A [ ; ; ]] Hint: note spaces to separate elements. Basic content slide: Add slide title and slide text in the appropriate places. To create a new slide, go to “Insert > New Slide” from the main menu. 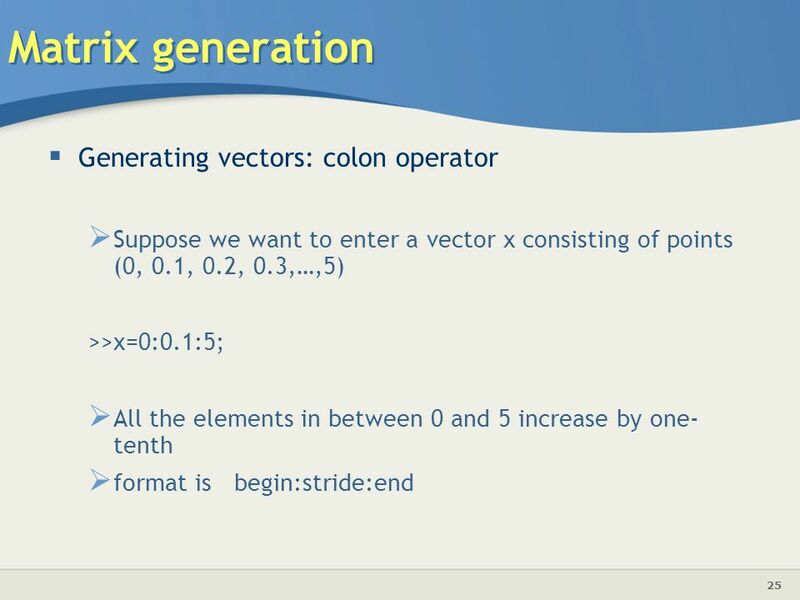 Suppose we want to enter a vector x consisting of points (0, 0.1, 0.2, 0.3,…,5) >>x=0:0.1:5; All the elements in between 0 and 5 increase by one-tenth format is begin:stride:end Basic content slide: Add slide title and slide text in the appropriate places. To create a new slide, go to “Insert > New Slide” from the main menu. 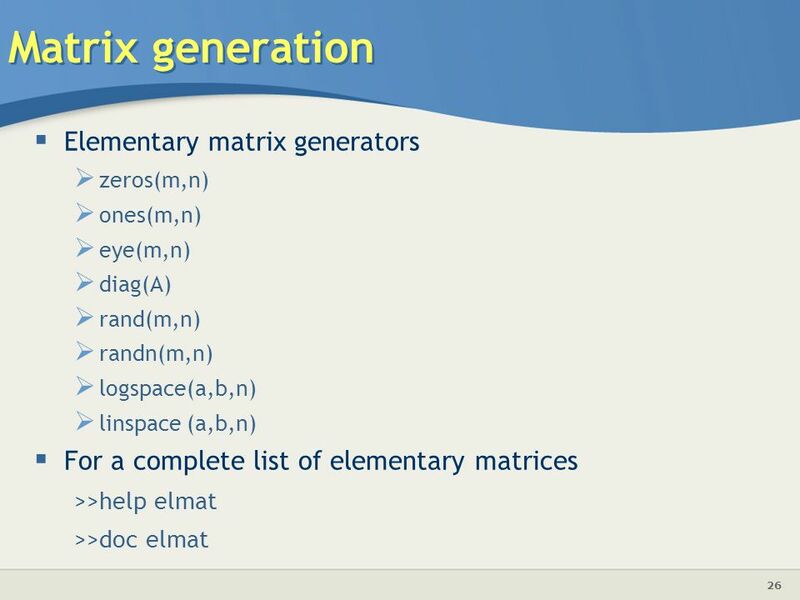 zeros(m,n) ones(m,n) eye(m,n) diag(A) rand(m,n) randn(m,n) logspace(a,b,n) linspace (a,b,n) For a complete list of elementary matrices >>help elmat >>doc elmat Basic content slide: Add slide title and slide text in the appropriate places. To create a new slide, go to “Insert > New Slide” from the main menu. 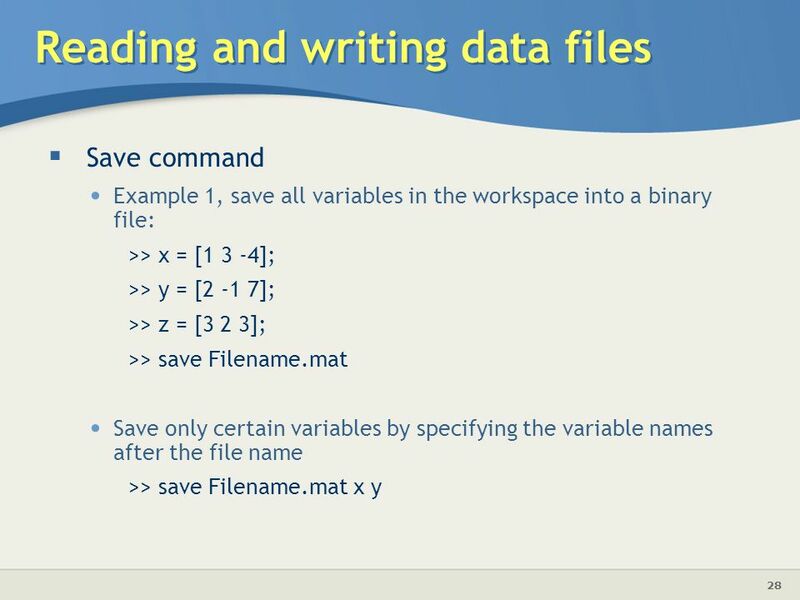 Save command Example 1, save all variables in the workspace into a binary file: >> x = [1 3 -4]; >> y = [2 -1 7]; >> z = [3 2 3]; >> save Filename.mat Save only certain variables by specifying the variable names after the file name >> save Filename.mat x y Basic content slide: Add slide title and slide text in the appropriate places. To create a new slide, go to “Insert > New Slide” from the main menu. 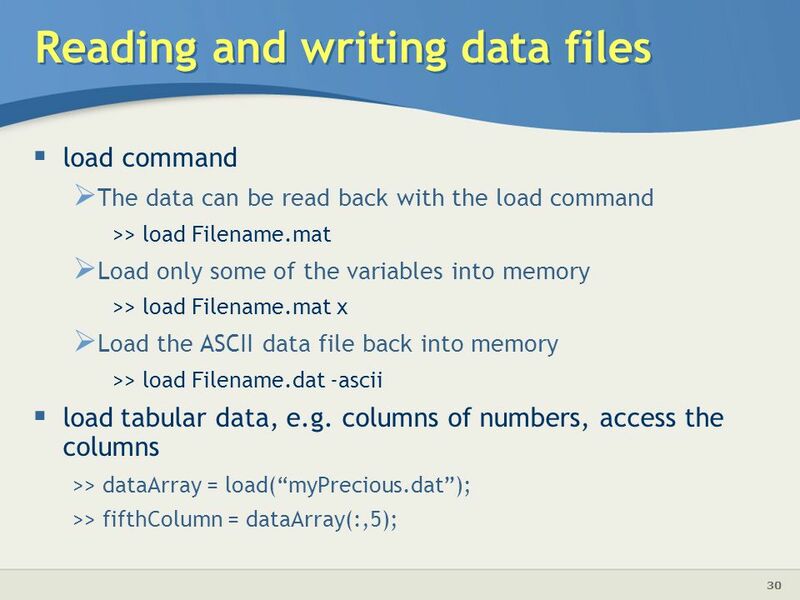 load command The data can be read back with the load command >> load Filename.mat Load only some of the variables into memory >> load Filename.mat x Load the ASCII data file back into memory >> load Filename.dat -ascii load tabular data, e.g. columns of numbers, access the columns >> dataArray = load(“myPrecious.dat”); >> fifthColumn = dataArray(:,5); Basic content slide: Add slide title and slide text in the appropriate places. To create a new slide, go to “Insert > New Slide” from the main menu. 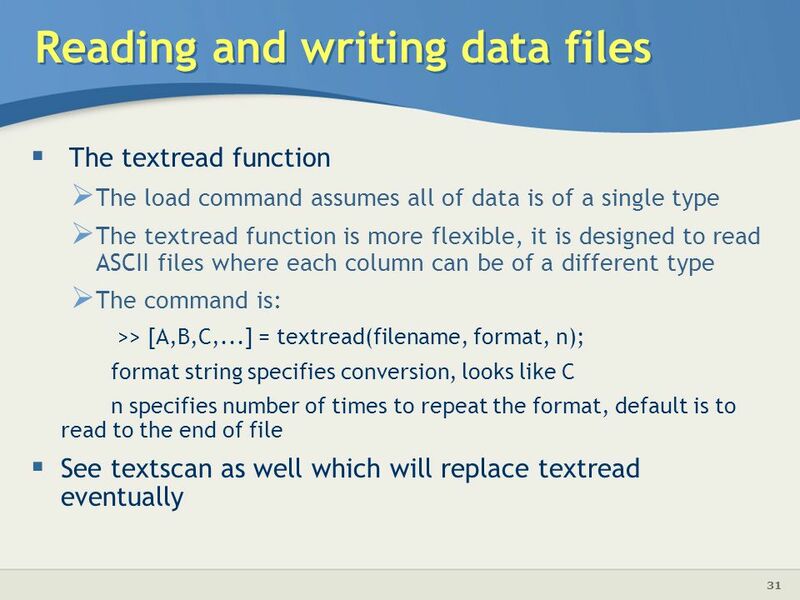 The textread function The load command assumes all of data is of a single type The textread function is more flexible, it is designed to read ASCII files where each column can be of a different type The command is: >> [A,B,C,...] = textread(filename, format, n); format string specifies conversion, looks like C n specifies number of times to repeat the format, default is to read to the end of file See textscan as well which will replace textread eventually Basic content slide: Add slide title and slide text in the appropriate places. To create a new slide, go to “Insert > New Slide” from the main menu. 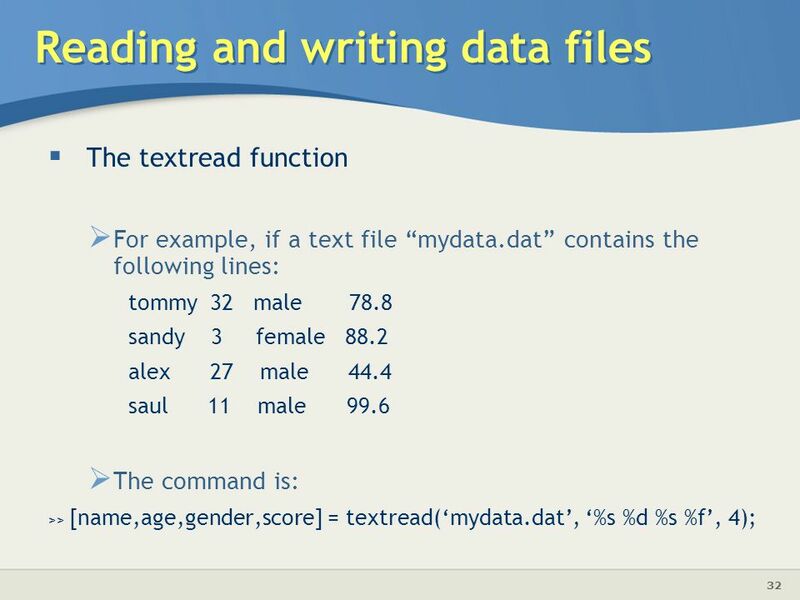 The textread function For example, if a text file “mydata.dat” contains the following lines: tommy male sandy female alex male saul male The command is: >> [name,age,gender,score] = textread(‘mydata.dat’, ‘%s %d %s %f’, 4); Basic content slide: Add slide title and slide text in the appropriate places. To create a new slide, go to “Insert > New Slide” from the main menu. 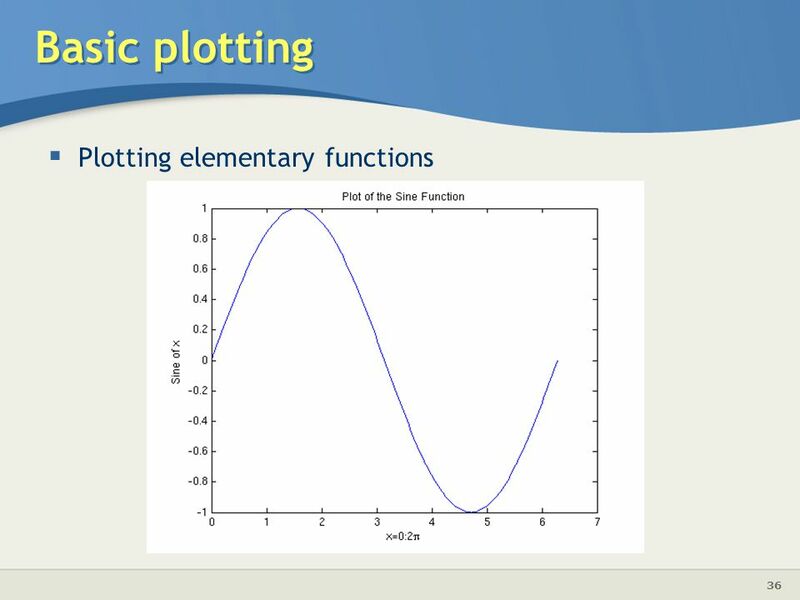 To plot the function y=sin(x) on the interval [0, 2p] >>x=0:pi/100:2*pi; >>y=sin(x); >>plot(x,y) >>xlabel (‘x=0:2\pi’); >>ylabel (‘Sine of x’); >>title (‘Plot of the Sine Function’); Basic content slide: Add slide title and slide text in the appropriate places. To create a new slide, go to “Insert > New Slide” from the main menu. 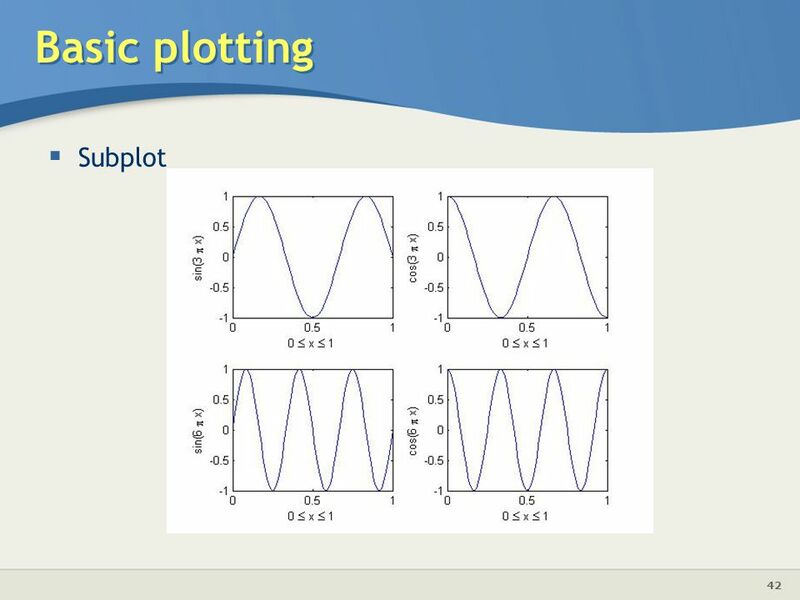 Several graphs may be drawn on the same figure For example, plot three related function of x: y1=2cos(x), y2=cos(x), and y3=0.5cos(x), on the interval [0, 2p] Basic content slide: Add slide title and slide text in the appropriate places. To create a new slide, go to “Insert > New Slide” from the main menu. >> x = 0:pi/100:2*pi; >> y1 = 2*cos(x); >> y2 = cos(x); >> y3 = 0.5*cos(x); >> plot(x,y1,‘--’,x,y2,‘-’,x,y3,‘:’) >> xlabel(‘0 \leq x \leq 2\pi’) >> ylabel(‘Cosine functions’) >> legend(‘2*cos(x)’,‘cos(x)’,‘0.5*cos(x)’) >> title(‘Typical example of multiple plots’) Basic content slide: Add slide title and slide text in the appropriate places. To create a new slide, go to “Insert > New Slide” from the main menu. The graphic window can be split into an m*n array of small windows. 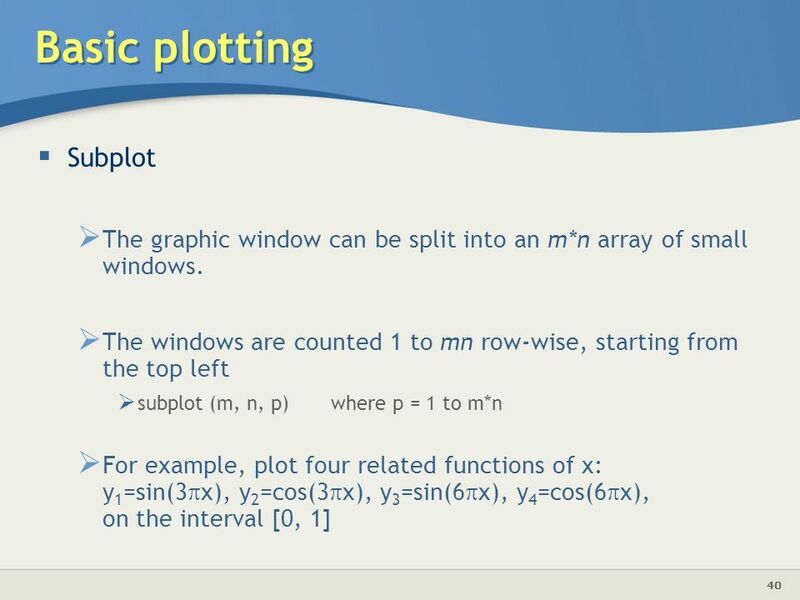 The windows are counted 1 to mn row-wise, starting from the top left subplot (m, n, p) where p = 1 to m*n For example, plot four related functions of x: y1=sin(3px), y2=cos(3px), y3=sin(6px), y4=cos(6px), on the interval [0, 1] Basic content slide: Add slide title and slide text in the appropriate places. To create a new slide, go to “Insert > New Slide” from the main menu. 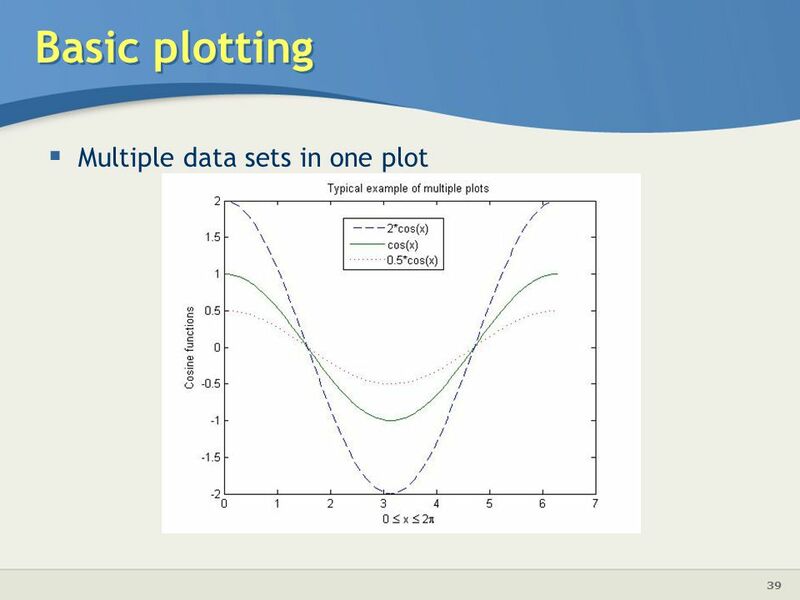 >> y1 = sin(3*pi*x); >> y2 = cos(3*pi*x); >> y3 = sin(6*pi*x); >> y4 = cos(6*pi*x); >> title(‘Typical example of subplots’) >> subplot(2,2,1), plot(x,y1) >> xlabel(‘0 \leq x \leq 1’), ylabel(‘sin(3 \pi x)’) >> subplot(2,2,2), plot(x,y2) >> xlabel(‘0 \leq x \leq 1’), ylabel(‘cos(3 \pi x)’) >> subplot(2,2,3), plot(x,y3) >> xlabel(‘0 \leq x \leq 1’), ylabel(‘sin(6 \pi x)’) >> subplot(2,2,4), plot(x,y4) >> xlabel(‘0 \leq x \leq 1’), ylabel(‘cos(6 \pi x)’) Basic content slide: Add slide title and slide text in the appropriate places. To create a new slide, go to “Insert > New Slide” from the main menu. In order to repeat any calculation and/or make any adjustments, it is simpler to create a file with a list of commands. 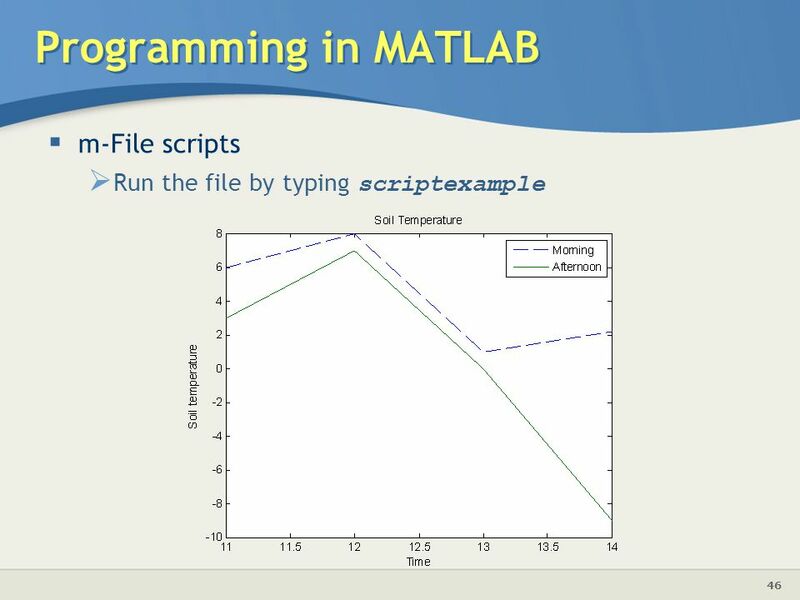 “File New  M-file” (or use your favorite editor/text processor) For example, put the commands for plotting soil temperature into a file called scriptexample.m Basic content slide: Add slide title and slide text in the appropriate places. To create a new slide, go to “Insert > New Slide” from the main menu. 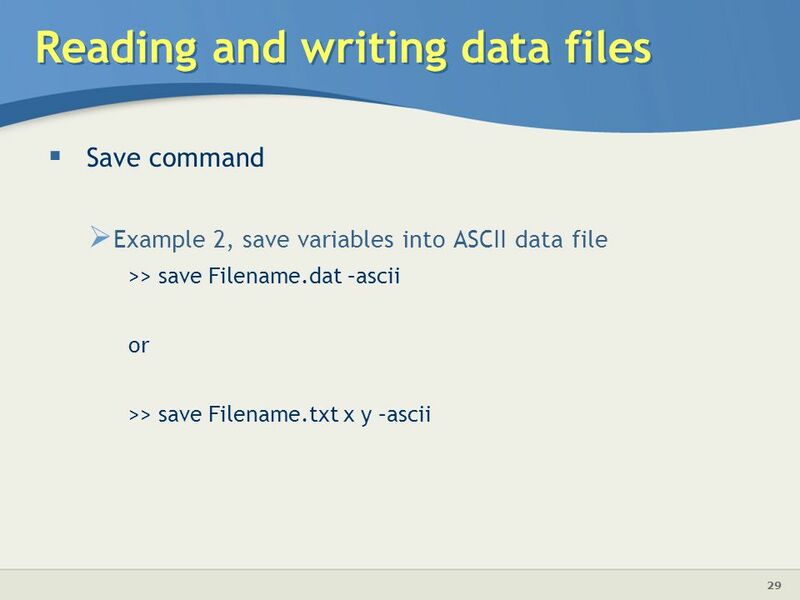 Run the file by typing scriptexample Basic content slide: Add slide title and slide text in the appropriate places. To create a new slide, go to “Insert > New Slide” from the main menu. 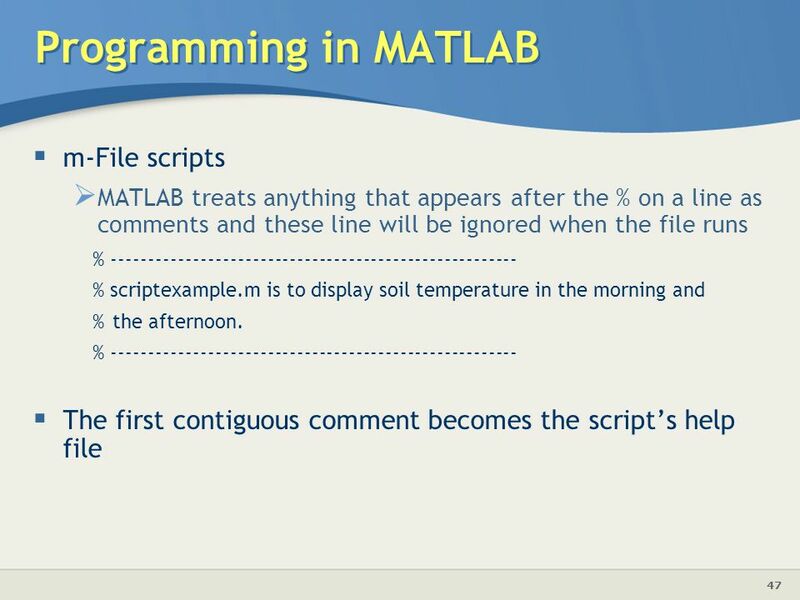 MATLAB treats anything that appears after the % on a line as comments and these line will be ignored when the file runs % % scriptexample.m is to display soil temperature in the morning and %	the afternoon. The first contiguous comment becomes the script’s help file Basic content slide: Add slide title and slide text in the appropriate places. To create a new slide, go to “Insert > New Slide” from the main menu. Functions are routines that are general and applicable to many problems. 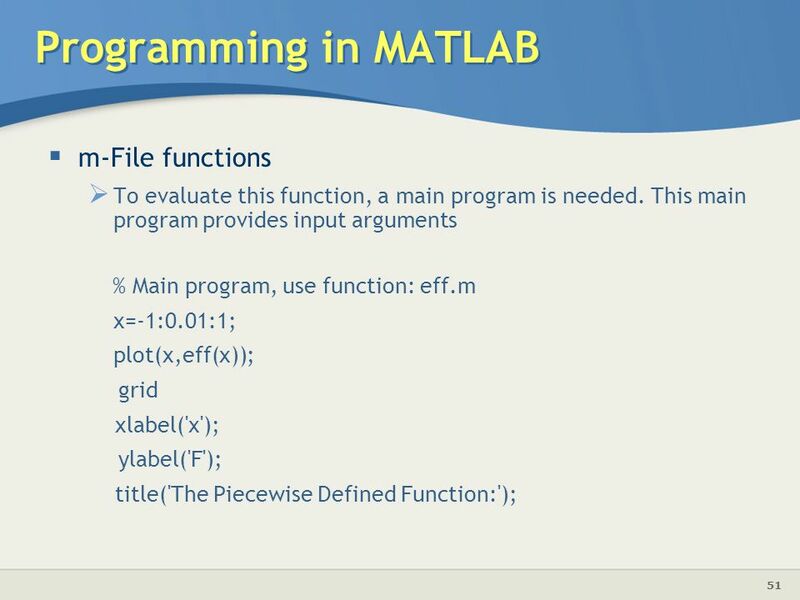 To define a MATLAB function: Decide a name for the function, making sure that it does not conflict a name that is already used by MATLAB. 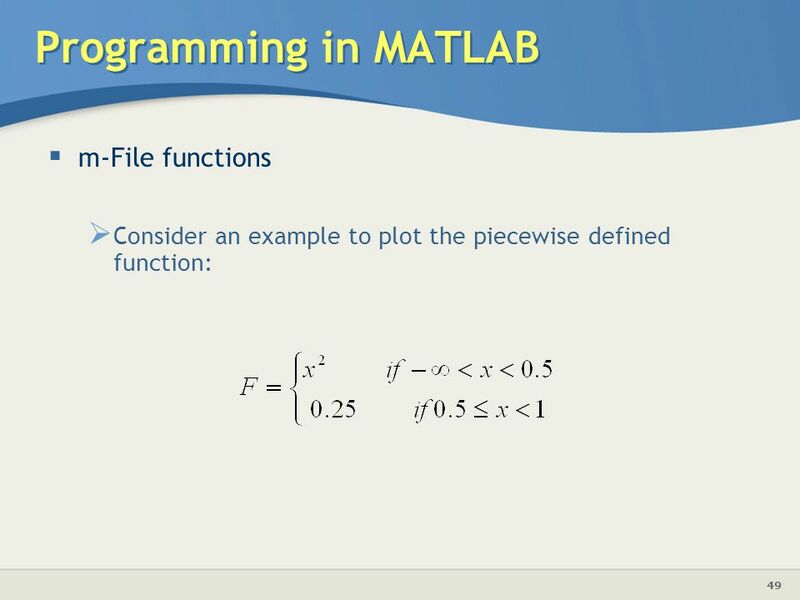 If you give your function the same name as am existing MATLAB function, MATLAB will use your function instead of its own. Type help nameofyourfunction to see if a function with the same name already exists i.e. >>help c2f >>c2f not found. 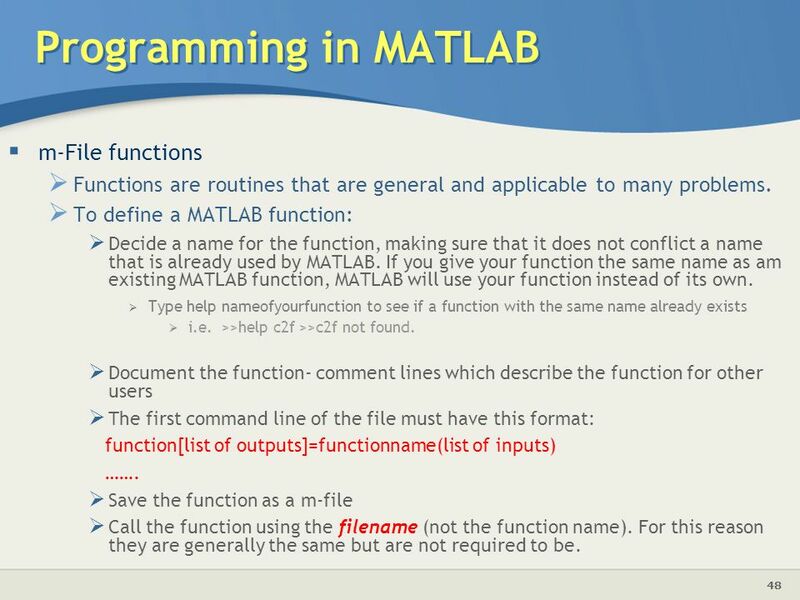 Document the function- comment lines which describe the function for other users The first command line of the file must have this format: function[list of outputs]=functionname(list of inputs) ……. Save the function as a m-file Call the function using the filename (not the function name). For this reason they are generally the same but are not required to be. Basic content slide: Add slide title and slide text in the appropriate places. To create a new slide, go to “Insert > New Slide” from the main menu. 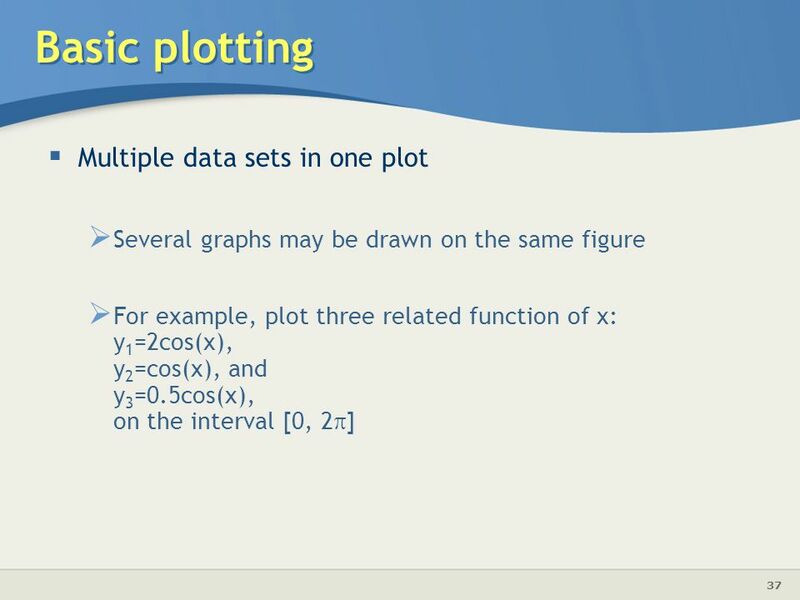 Consider an example to plot the piecewise defined function: Basic content slide: Add slide title and slide text in the appropriate places. To create a new slide, go to “Insert > New Slide” from the main menu. It is convenient to have a separate file which can do a specific calculation. 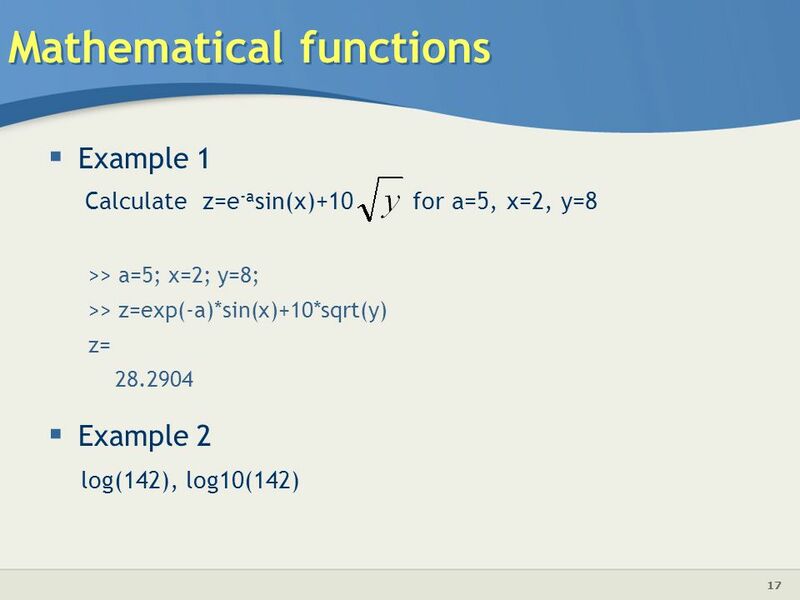 function [F]= eff(x) % Function to calculate values % Input x % Output F for i=1:length(x) if x(i)<0.5 F(i)=x(i)^2; else F(i)=0.25; end Basic content slide: Add slide title and slide text in the appropriate places. To create a new slide, go to “Insert > New Slide” from the main menu. 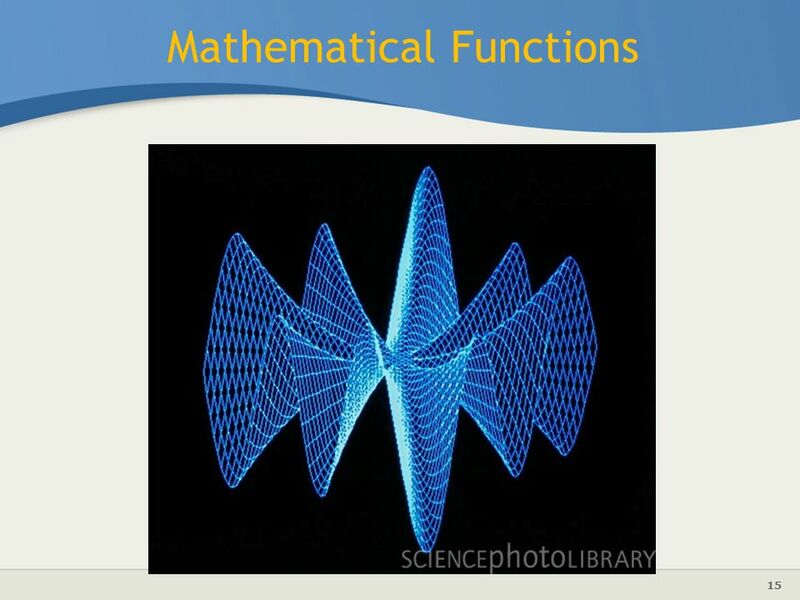 To evaluate this function, a main program is needed. 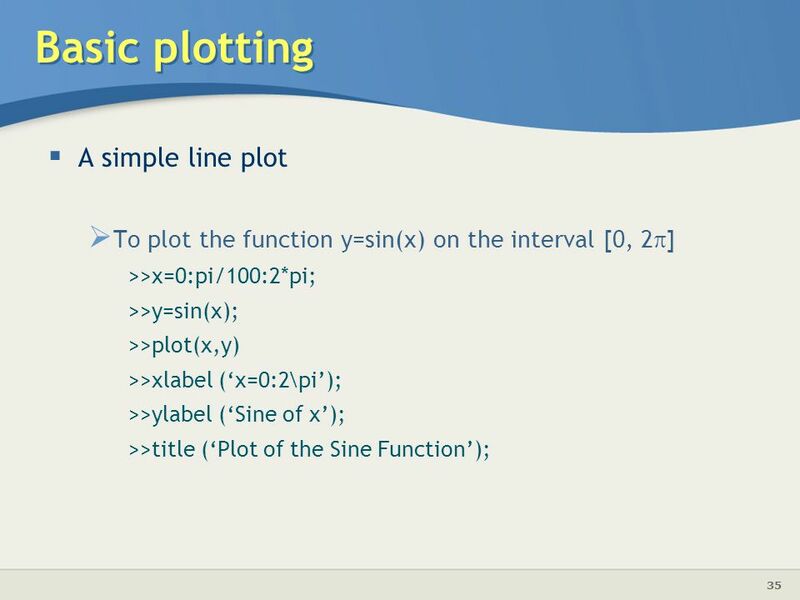 This main program provides input arguments % Main program, use function: eff.m x=-1:0.01:1; plot(x,eff(x)); grid xlabel('x'); ylabel('F'); title('The Piecewise Defined Function:'); Basic content slide: Add slide title and slide text in the appropriate places. To create a new slide, go to “Insert > New Slide” from the main menu. 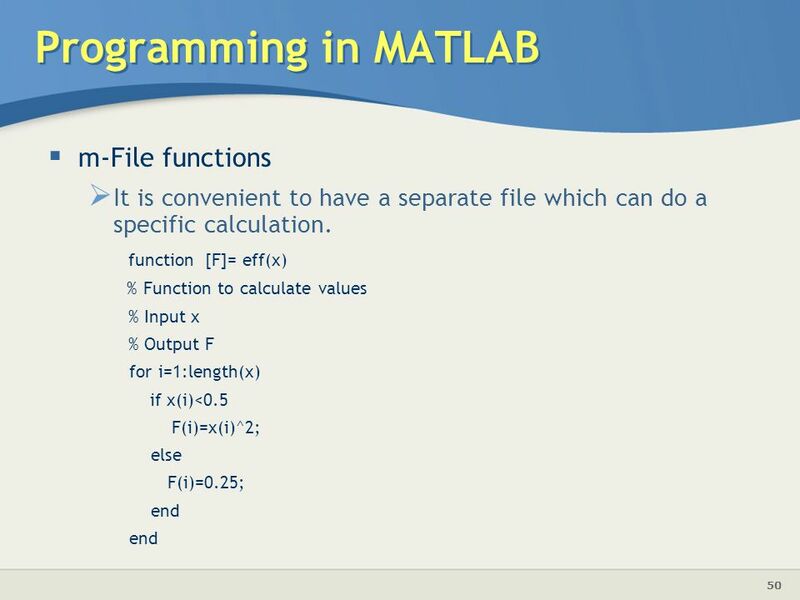 53 Programming in MATLAB Create a program! 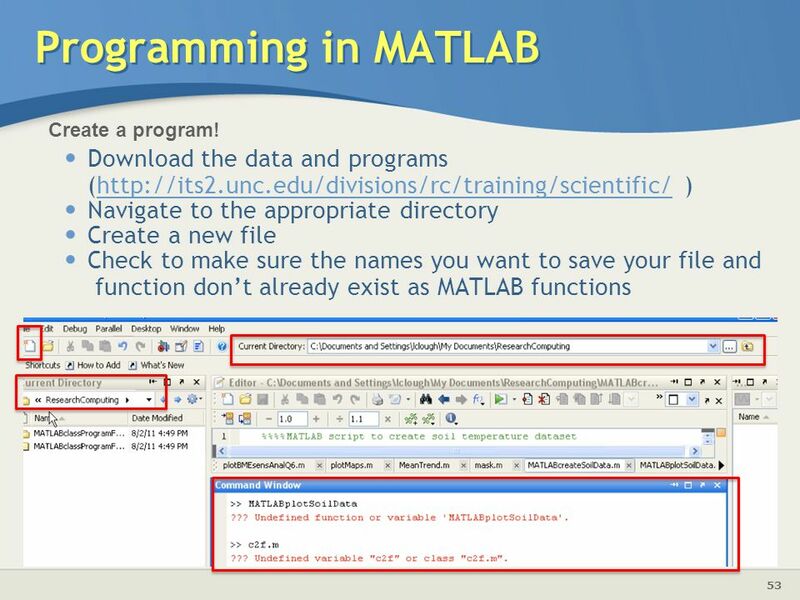 Download the data and programs ( ) Navigate to the appropriate directory Create a new file Check to make sure the names you want to save your file and function don’t already exist as MATLAB functions Basic content slide: Add slide title and slide text in the appropriate places. To create a new slide, go to “Insert > New Slide” from the main menu. 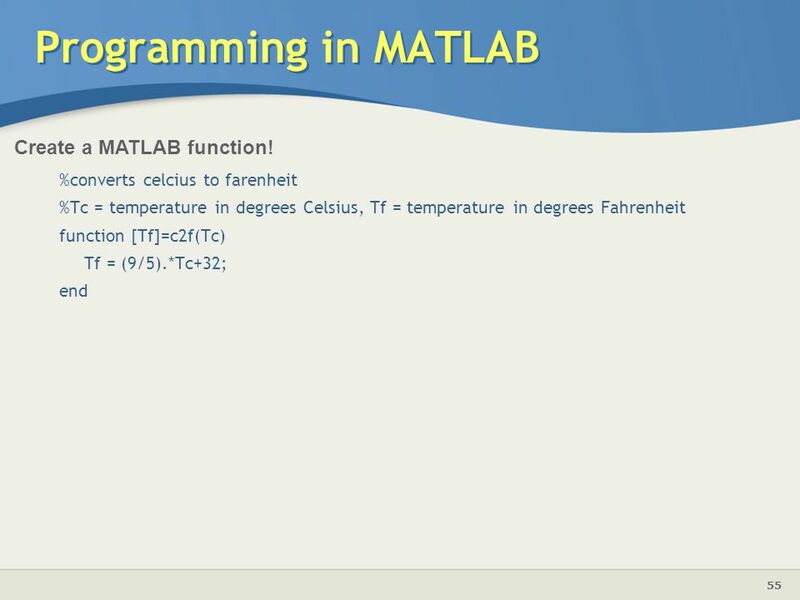 54 Programming in MATLAB Create a MATLAB program and function! 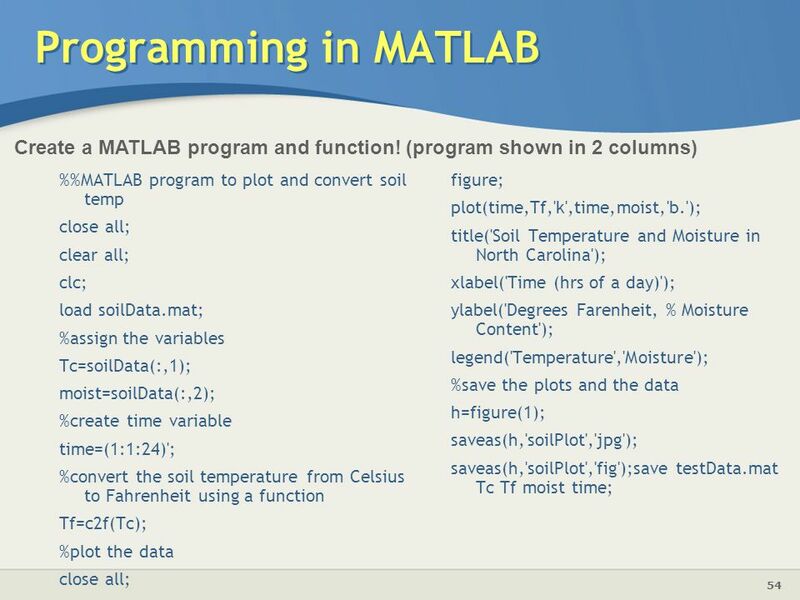 (program shown in 2 columns) %%MATLAB program to plot and convert soil temp close all; clear all; clc; load soilData.mat; %assign the variables Tc=soilData(:,1); moist=soilData(:,2); %create time variable time=(1:1:24)'; %convert the soil temperature from Celsius to Fahrenheit using a function Tf=c2f(Tc); %plot the data figure; plot(time,Tf,'k',time,moist,'b. '); title('Soil Temperature and Moisture in North Carolina'); xlabel('Time (hrs of a day)'); ylabel('Degrees Farenheit, % Moisture Content'); legend('Temperature','Moisture'); %save the plots and the data h=figure(1); saveas(h,'soilPlot','jpg'); saveas(h,'soilPlot','fig');save testData.mat Tc Tf moist time; Basic content slide: Add slide title and slide text in the appropriate places. To create a new slide, go to “Insert > New Slide” from the main menu. 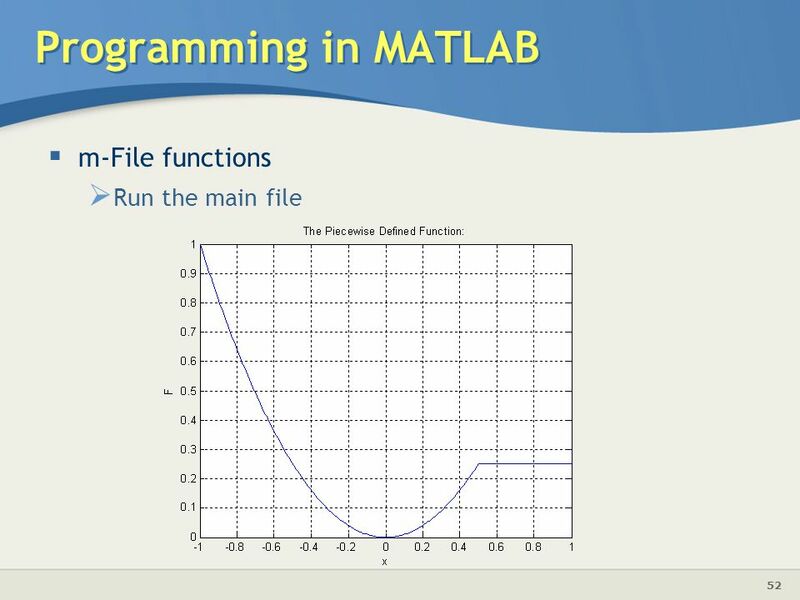 55 Programming in MATLAB Create a MATLAB function! %converts celcius to farenheit %Tc = temperature in degrees Celsius, Tf = temperature in degrees Fahrenheit function [Tf]=c2f(Tc) Tf = (9/5). *Tc+32; end Basic content slide: Add slide title and slide text in the appropriate places. To create a new slide, go to “Insert > New Slide” from the main menu. 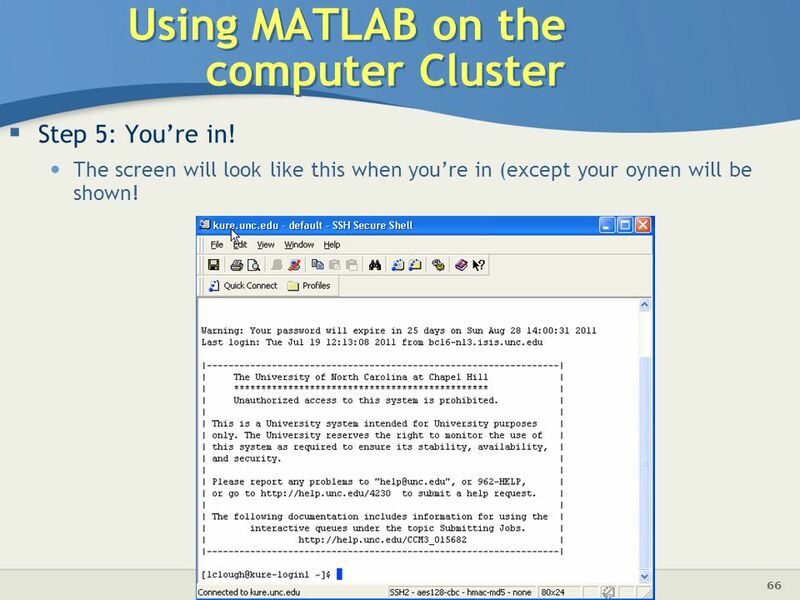 56 Programming in MATLAB Run the program! 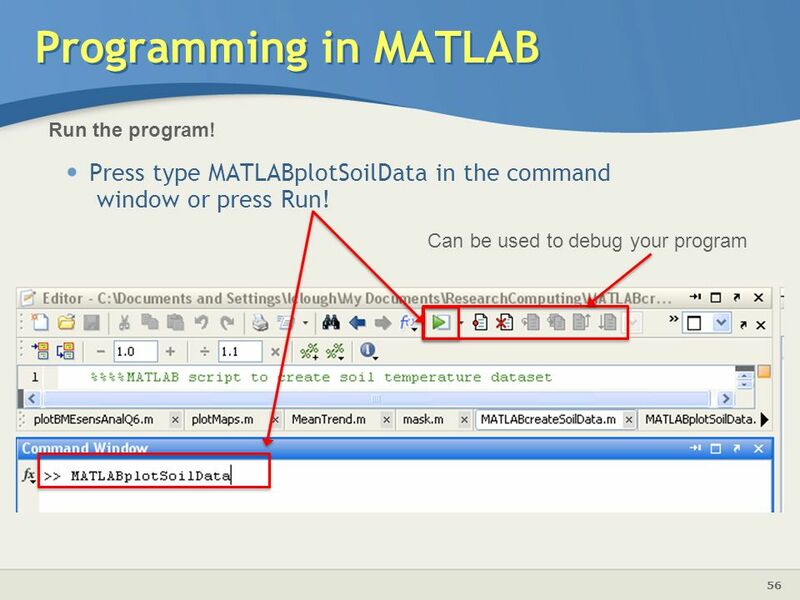 Press type MATLABplotSoilData in the command window or press Run! 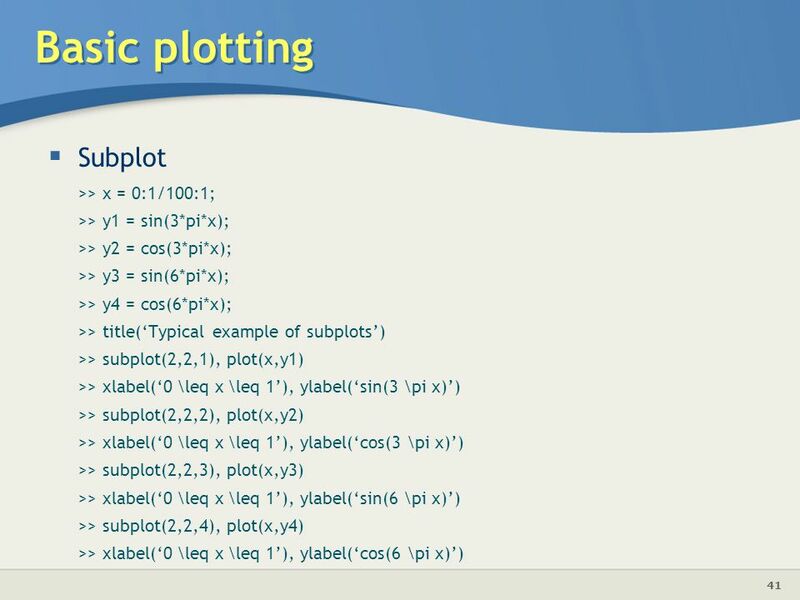 Can be used to debug your program Basic content slide: Add slide title and slide text in the appropriate places. To create a new slide, go to “Insert > New Slide” from the main menu. 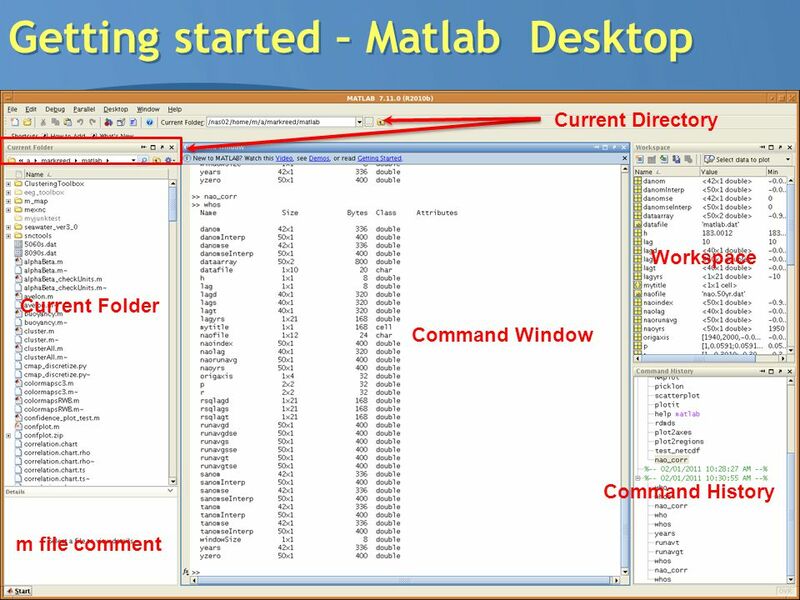 57 Programming in MATLAB Results! 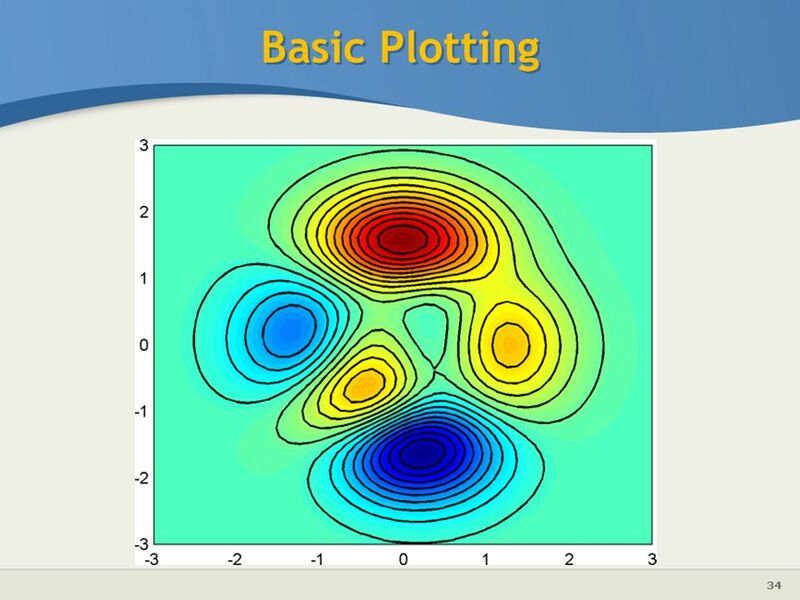 Soilplot.jpg (jpg file- portable and transferable) Soilpot.fig MATLAB figure file, you can edit this at a later time! 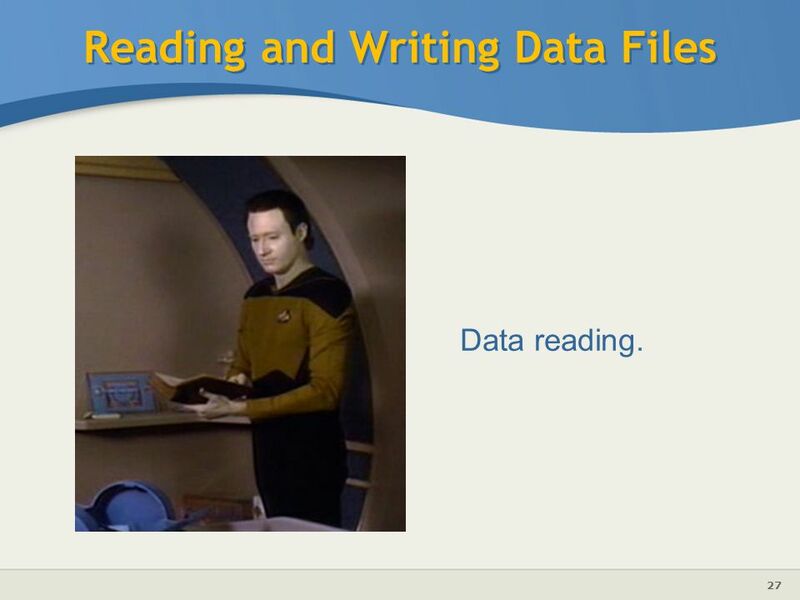 Basic content slide: Add slide title and slide text in the appropriate places. To create a new slide, go to “Insert > New Slide” from the main menu. What?? 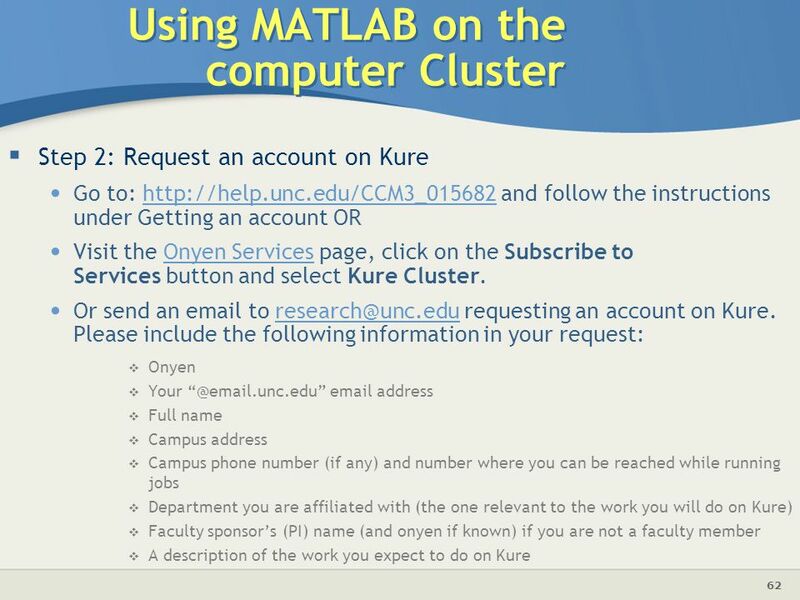 UNC provides researchers and graduate students with access to extremely powerful computers to use for their research. Kure is a Linux based computing system with >1,800 core processors Why?? 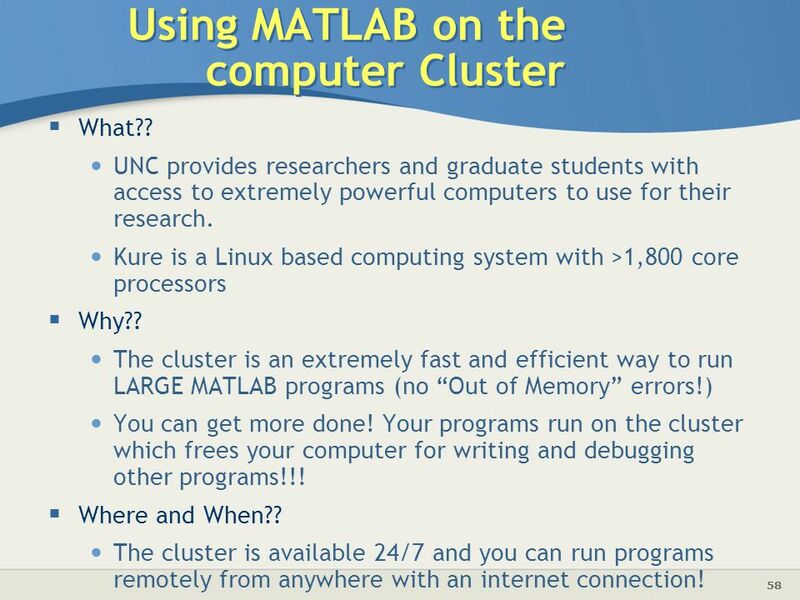 The cluster is an extremely fast and efficient way to run LARGE MATLAB programs (no “Out of Memory” errors!) You can get more done! 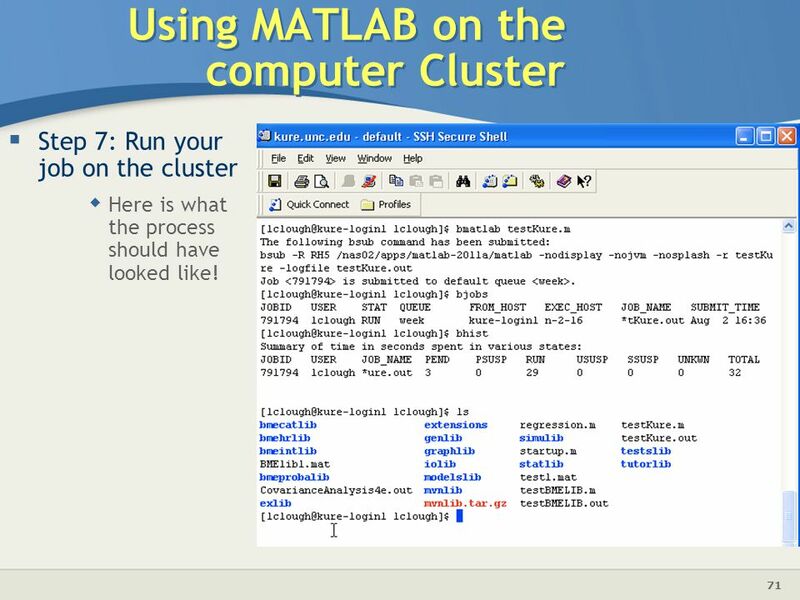 Your programs run on the cluster which frees your computer for writing and debugging other programs!!! Where and When?? The cluster is available 24/7 and you can run programs remotely from anywhere with an internet connection! Step 5: You’re in! The screen will look like this when you’re in (except your oynen will be shown! 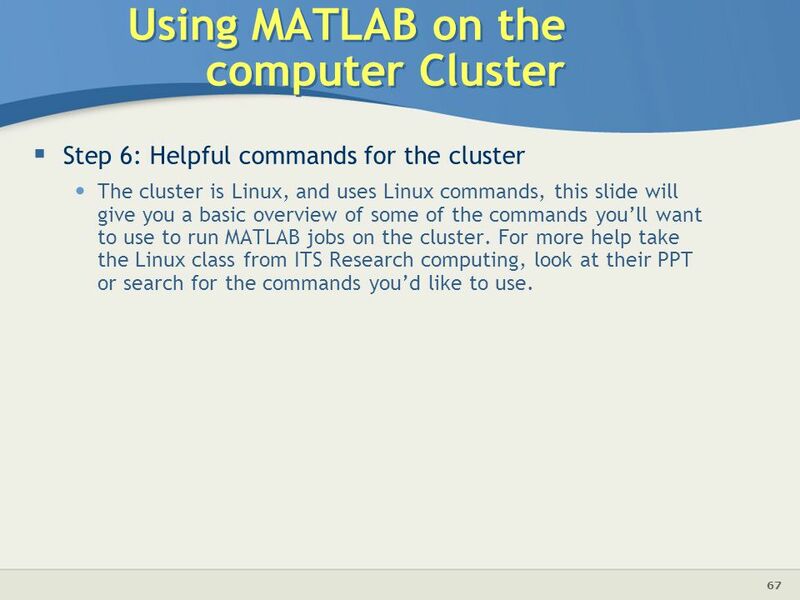 Step 6: Helpful commands for the cluster The cluster is Linux, and uses Linux commands, this slide will give you a basic overview of some of the commands you’ll want to use to run MATLAB jobs on the cluster. 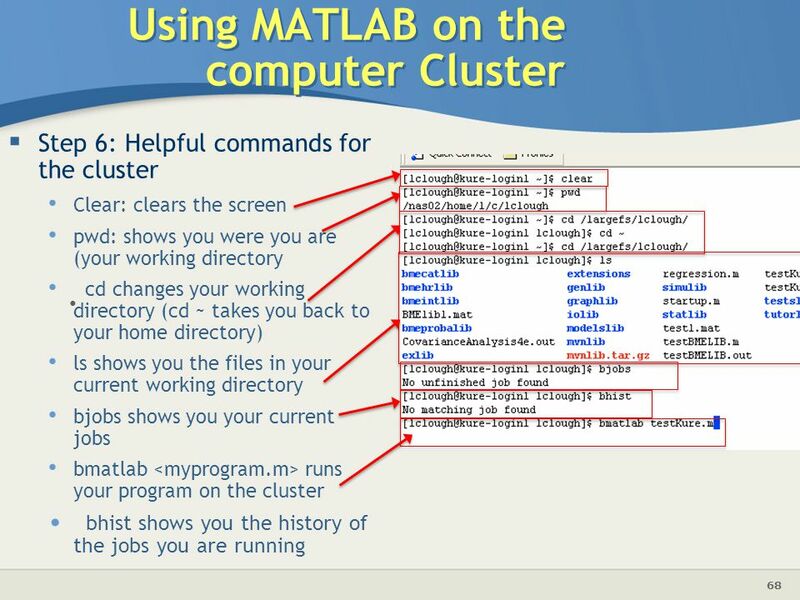 For more help take the Linux class from ITS Research computing, look at their PPT or search for the commands you’d like to use. 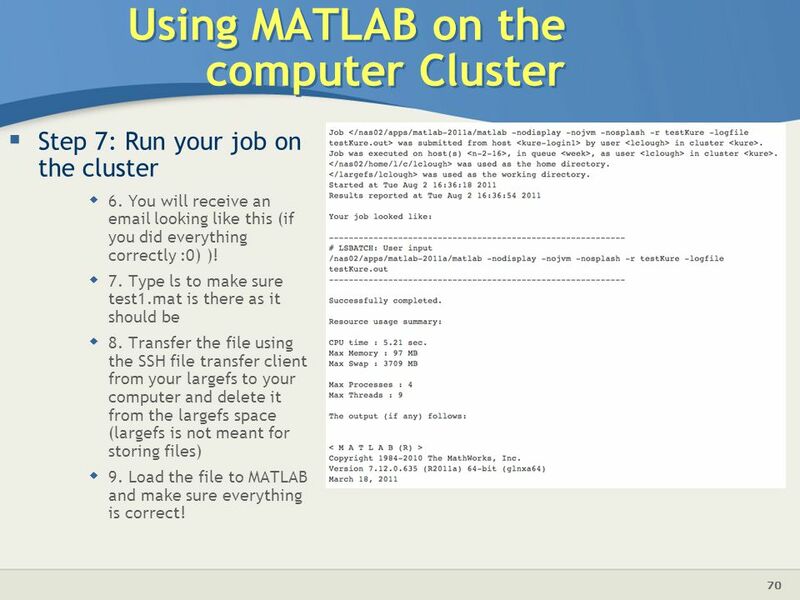 Step 7: Run your job on the cluster 6. You will receive an looking like this (if you did everything correctly :0) )! 7. Type ls to make sure test1.mat is there as it should be 8. Transfer the file using the SSH file transfer client from your largefs to your computer and delete it from the largefs space (largefs is not meant for storing files) 9. 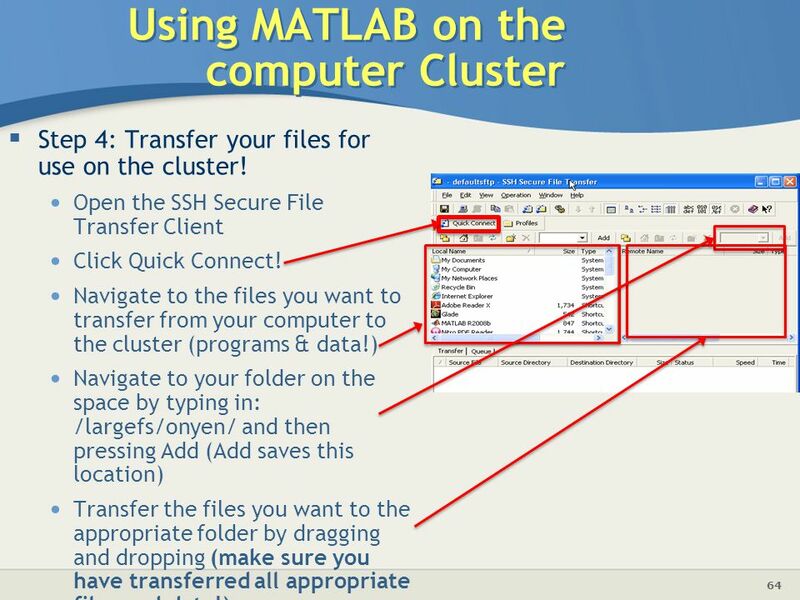 Load the file to MATLAB and make sure everything is correct! 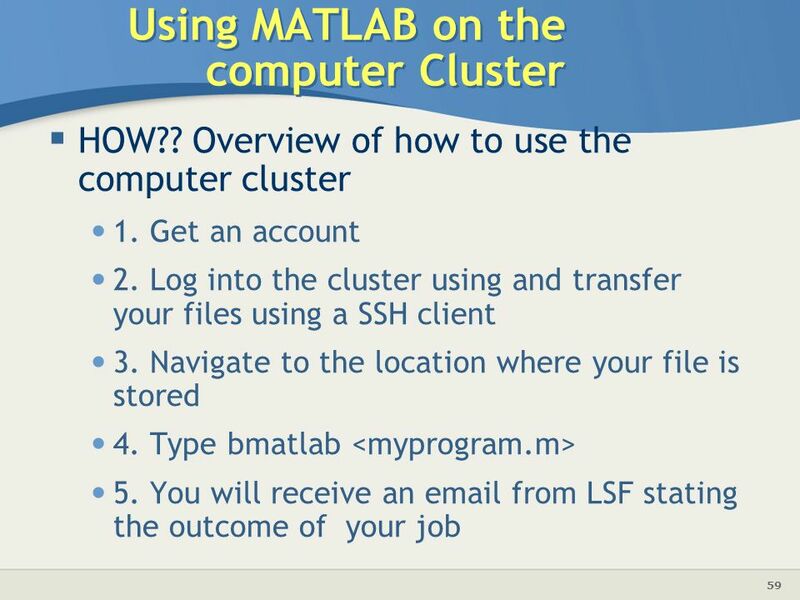 Step 7: Run your job on the cluster Here is what the process should have looked like! 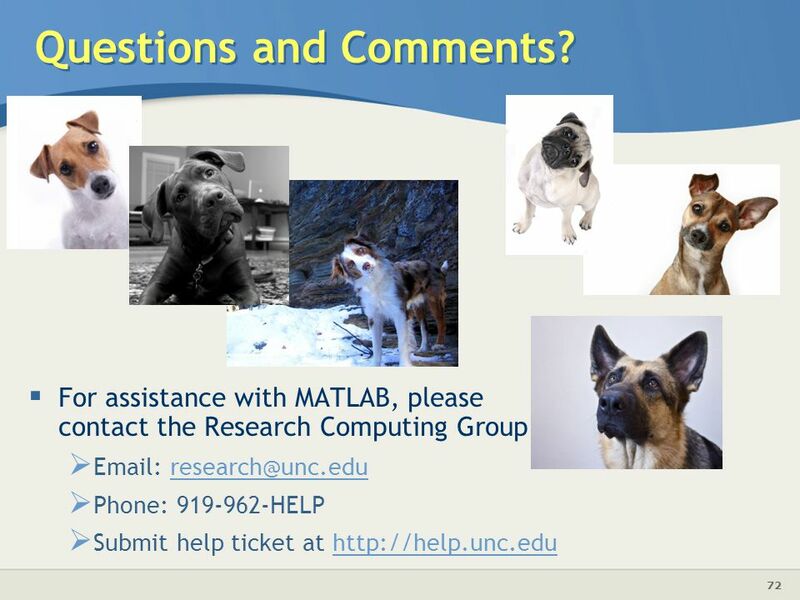 For assistance with MATLAB, please contact the Research Computing Group: Phone: HELP Submit help ticket at Basic content slide: Add slide title and slide text in the appropriate places. To create a new slide, go to “Insert > New Slide” from the main menu. 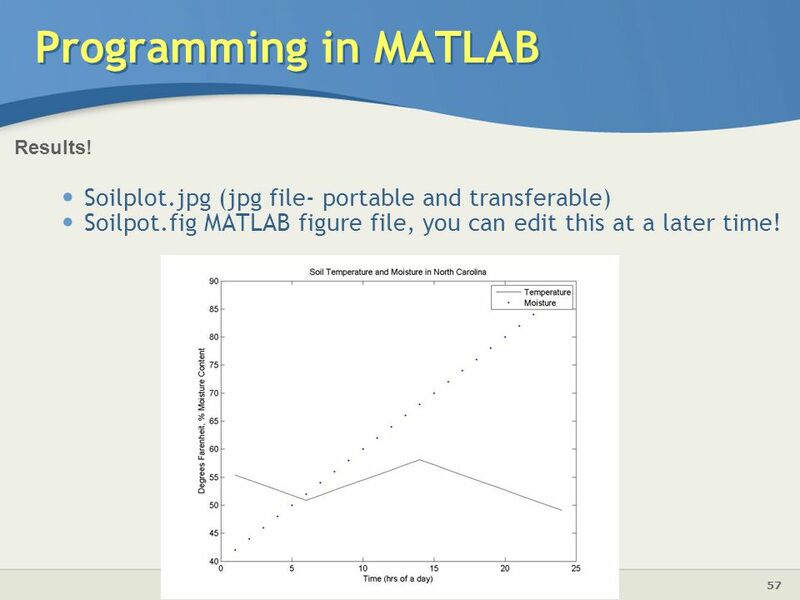 Download ppt "Introduction to MATLAB"
StatLab Workshop Yale University Maximiliano Appendino, Economics October 18 th, 2013. 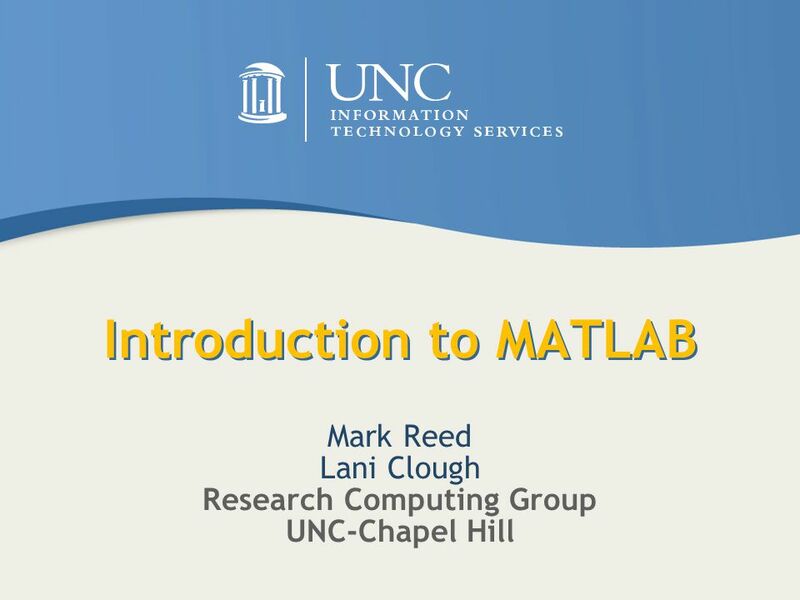 Introduction to MATLAB The language of Technical Computing. 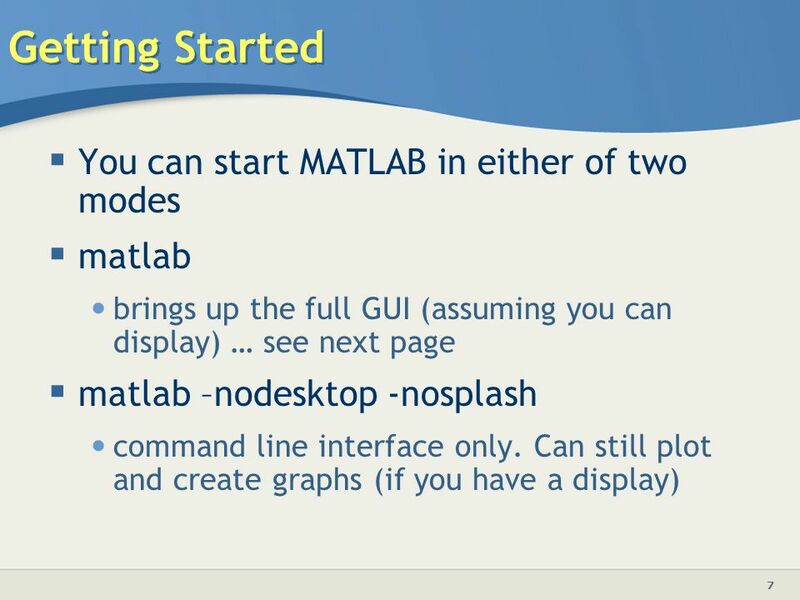 Introduction to Matlab Workshop Matthew Johnson, Economics October 17, /13/20151. 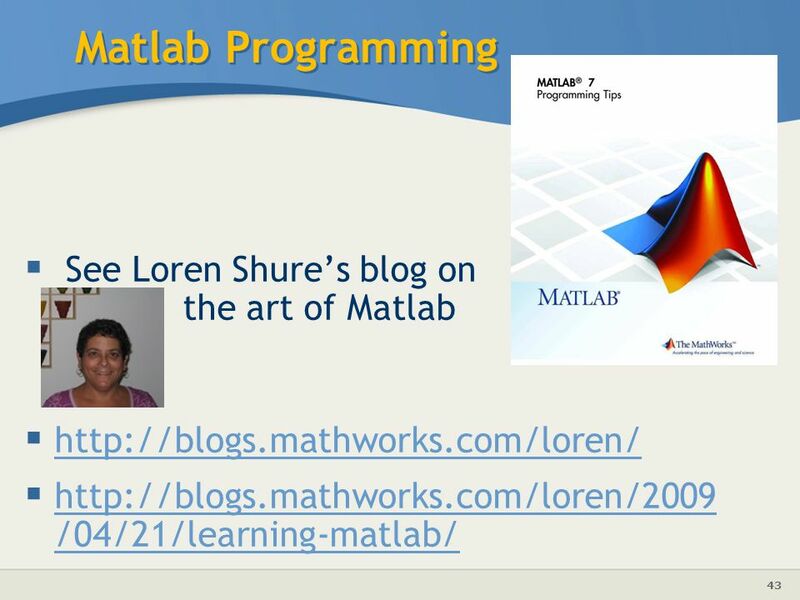 M AT L AB Programming: scripts & functions. Scripts It is possible to achieve a lot simply by executing one command at a time on the command line (even. 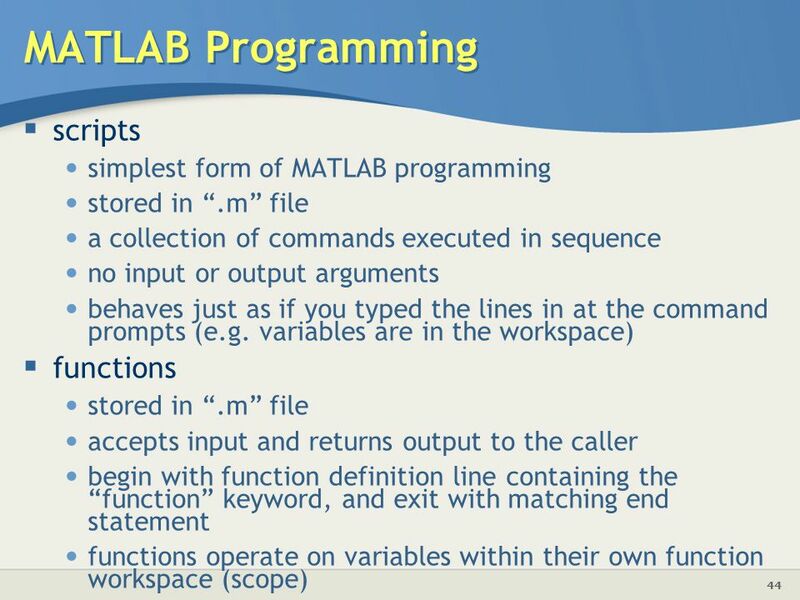 MATLAB – What is it? 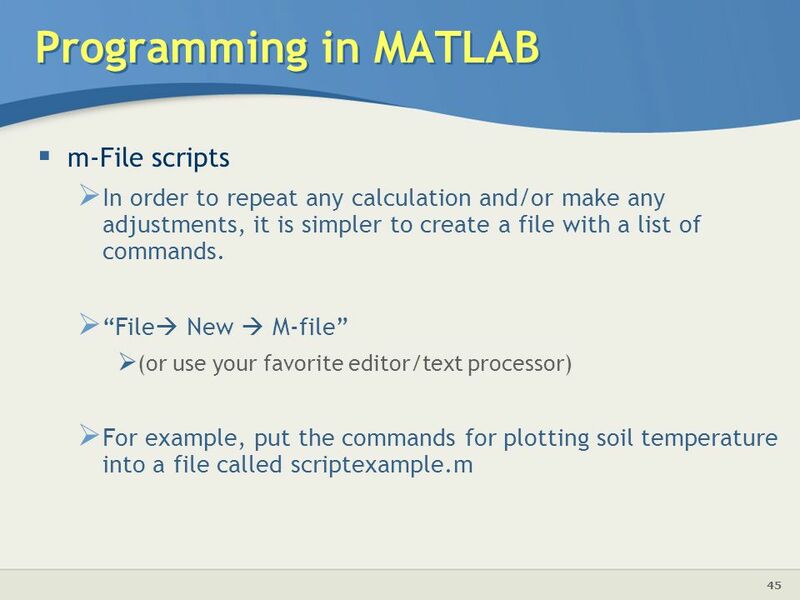 Computing environment / programming language Tool for manipulating matrices Many applications, you just need to get some numbers in. Lecture 7 Debugging Code & Data Import/Export © 2007 Daniel Valentine. All rights reserved. Published by Elsevier. 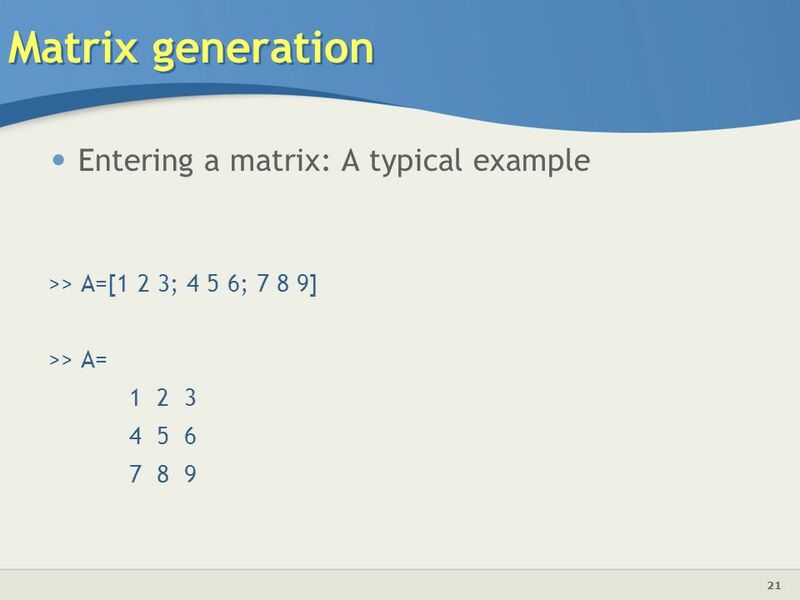 EGR 106 – Week 2 – Arrays Definition, size, and terminology Construction methods Addressing and sub-arrays Some useful functions for arrays Character arrays. 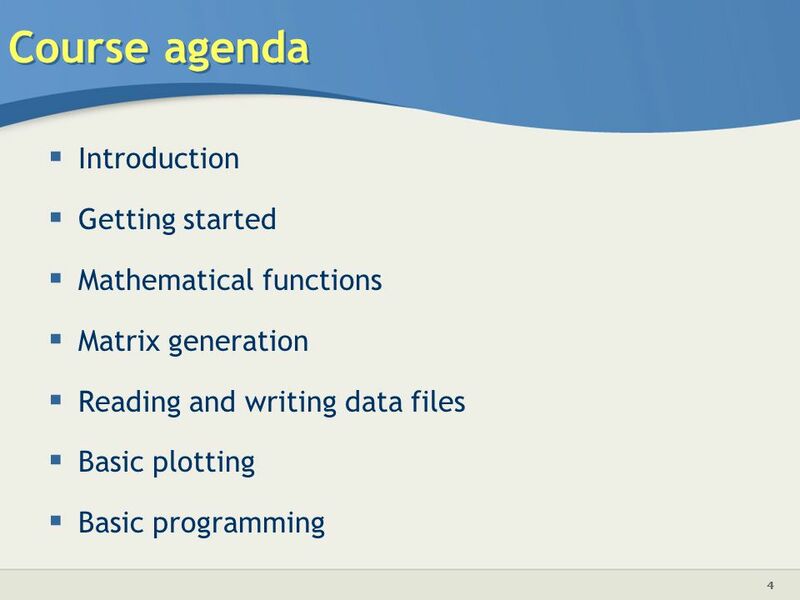 EGR 106 – Week 2 – Arrays & Scripts Brief review of last week Arrays: – Concept – Construction – Addressing Scripts and the editor Audio arrays Textbook. 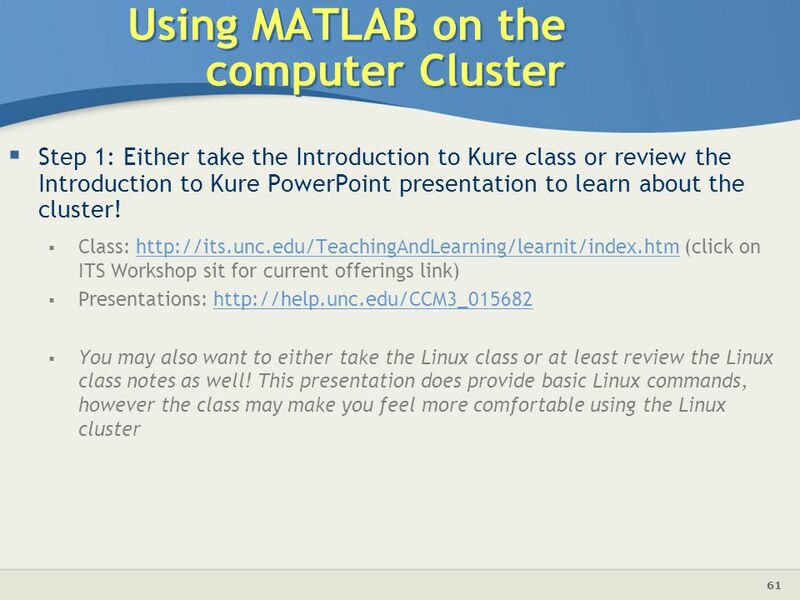 Introduction to MATLAB Northeastern University: College of Computer and Information Science Co-op Preparation University (CPU) 10/22/2003.